Let me tell you about Japanese Airlines…! 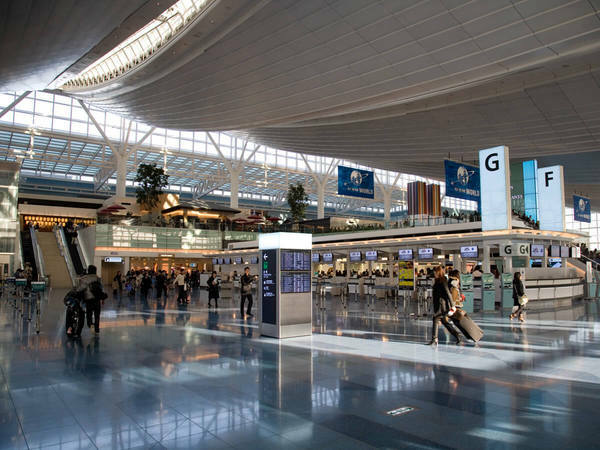 In general, Japanese service is so much better whether it be the airlines, a hotel, or the restaurants! My seats were located in the Premium Economy section. The seats in this section recline and slide much further back than regular economy class and there is a foot rest. 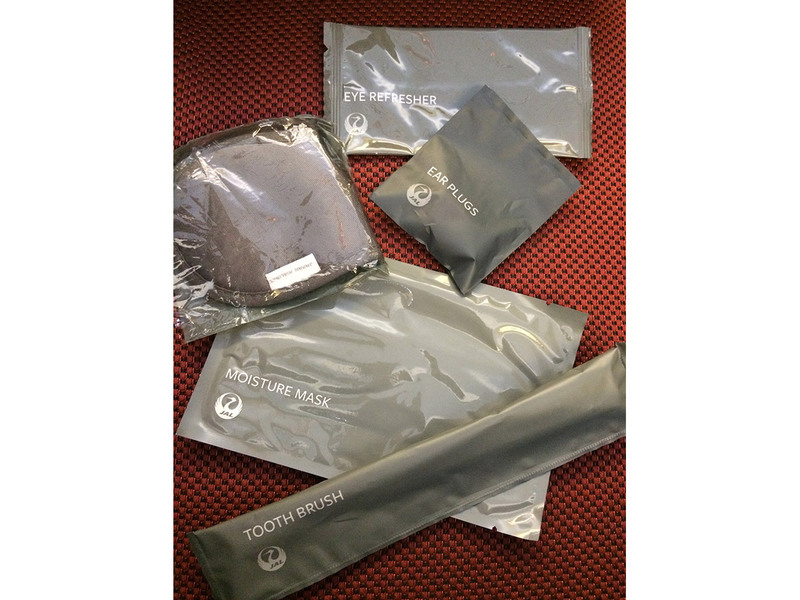 One of the best parts of Premium Economy is that you get amenities like an eye mask, a moisturizing mask, ear plugs, a toothbrush, and an eye refresher. Since we are stuck in the seat for 11 hours we might as well be as comfortable as possible! It has been 5 months since I last visited Tokyo. This time, I’ll be a tourist and let people take me around! Our first stop is ASAKUSA. I bet a lot of people who have been to Tokyo have visited Asakusa as well. We took a train there from Shibuya. The hotel I’m staying in is called Excel Shibuya and it is actually connected to the train station. It’s pretty easy and quick to get to Shibuya station. 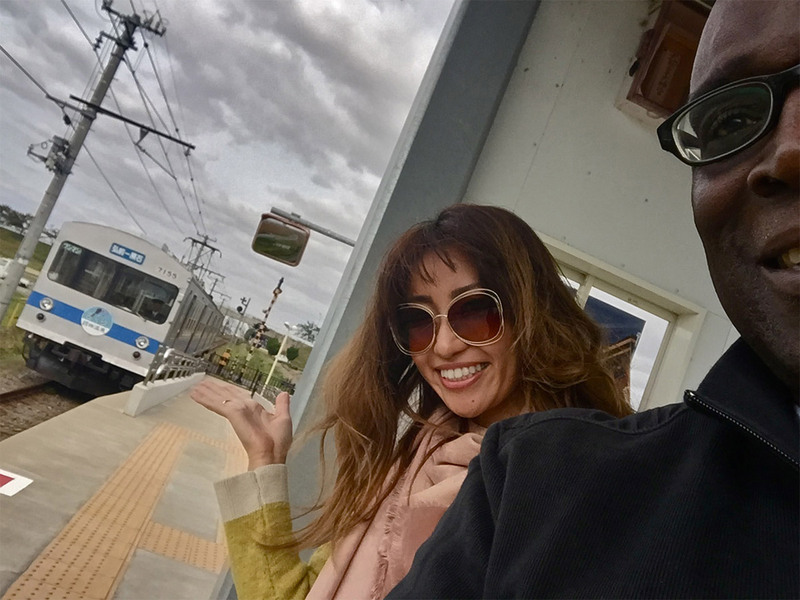 We took Ginza line to get to Asakusa… And oh my goodness, I thought we’d be smashed into the train like I’ve seen on youtube!!! But, it wasn’t that bad. Haha! The train was crowded but not like touching to strangers. Phew! And it’s super easy from Shibuya by Ginza line. We went around to see those little souvenir shops and the temple first. It’s Tuesday, but oh my it is packed!! 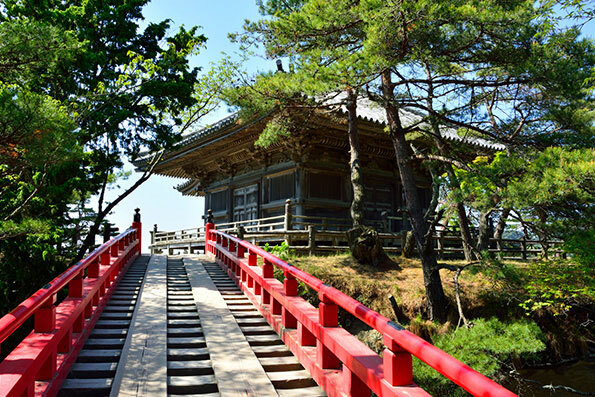 Sensouji is one of the most popular tourist places. We tried little Japanese treats, my favorite being Ningyo-yaki, which I couldn’t try due to the time. 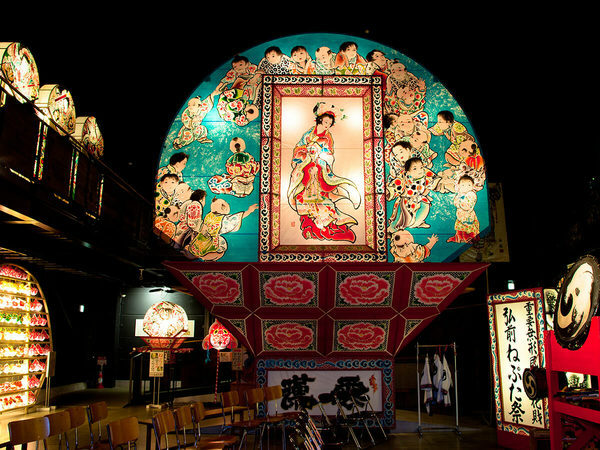 Ningyoyaki is shaped like various different faces or dolls or animals and inside there is sweet red bean paste . I saw some stores making it fresh! It is the MUST try!! Now we have all dressed up and are going to go around with a Jinrikisha! This is my first time to be on this kind of thing but I felt a bit nervous because I thought we were too heavy for him… But you know what? 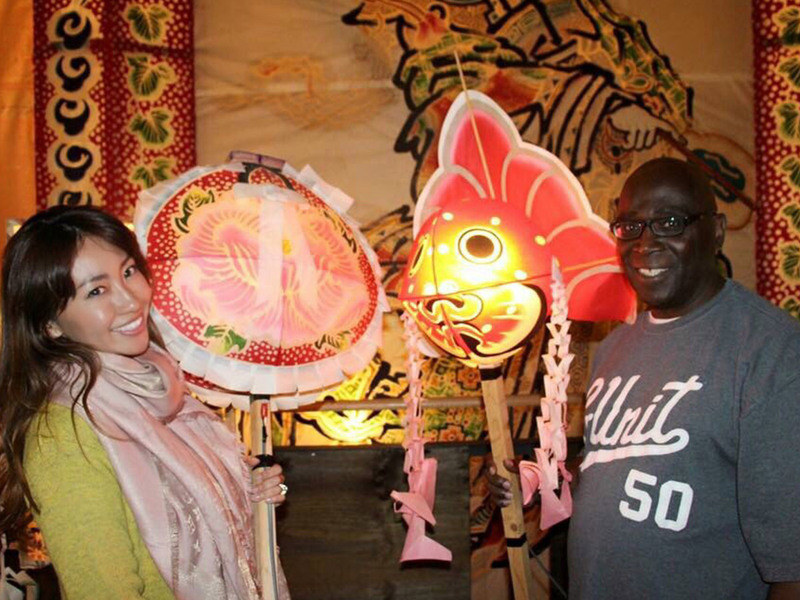 He started with ease and he guided us around Asakusa! He even explained what we were seeing in English ! I started the day with a walking tour of Asakusa. 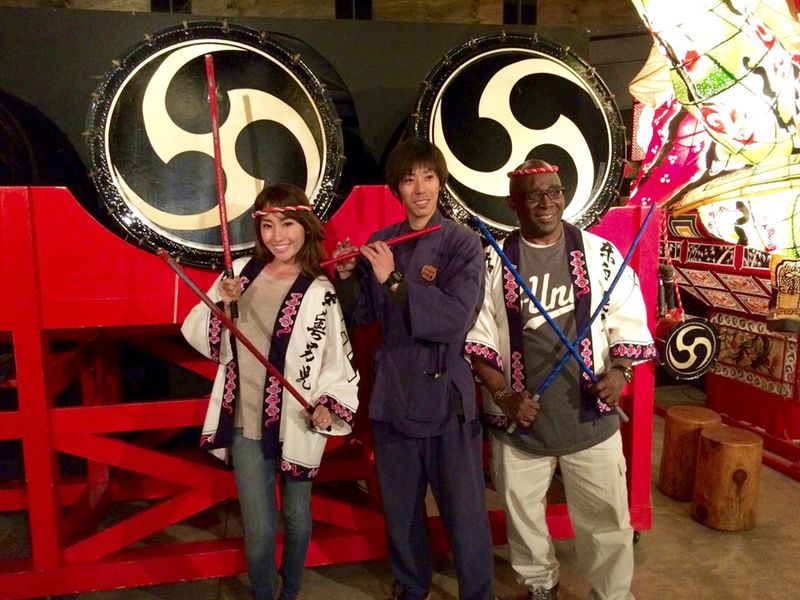 The area is amazing to me in that it features so much rich traditional history of Japan. At the same time, you can see the advent of new Japan with the visible presence of the Tokyo Sky Tree that is visible in the background rom many of the streets and shops. 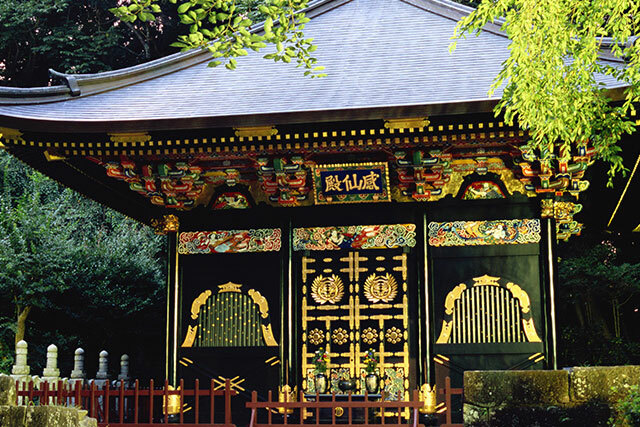 Asakusa is easily accessible by train ride from any part of Tokyo. I took the train from Shibuya. What I found when I got there was something really pleasant. There were a large number of foreign tourists who were also visiting the temple at the time. It seems the word has gotten out! 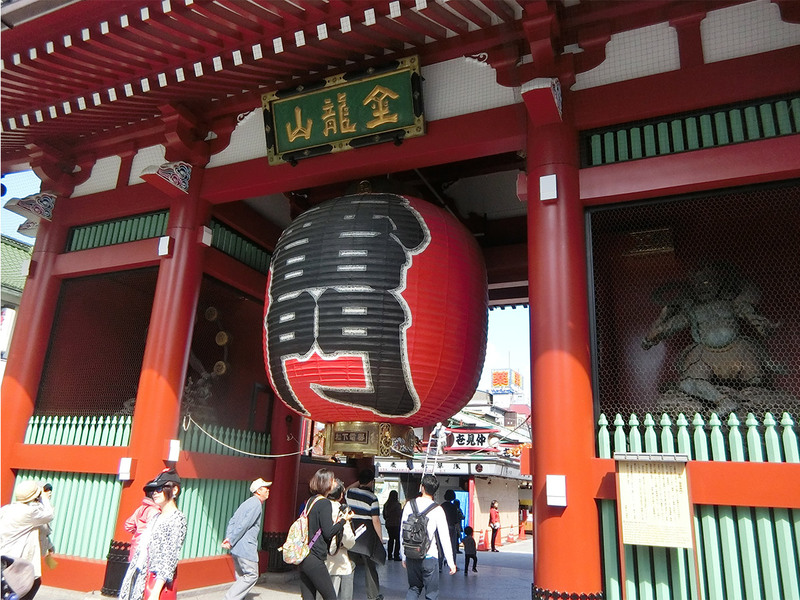 Maybe it is the impressive red Kaminarimon Thunder Gates" that greets you as you enter the Sensoji Temple. Or it could be the variety of shops that line the pathway leading up to the temple. 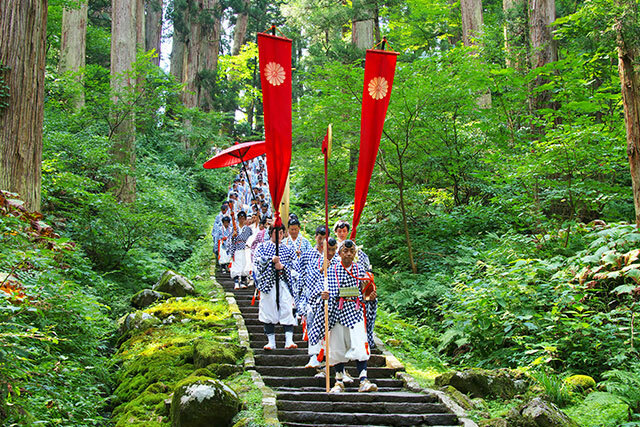 For me, it all adds to the magical charm of visiting one of Japan's most cherished shrines. 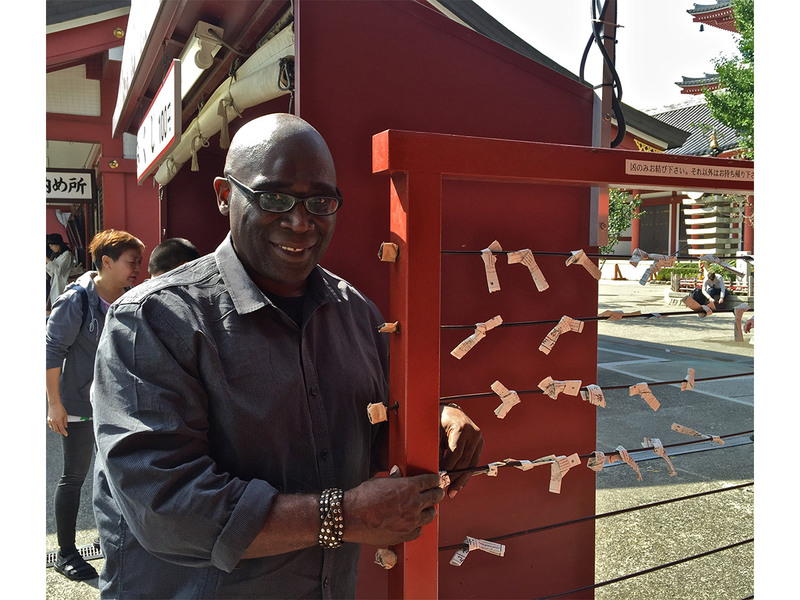 I took the opportunity to select my fortune (I selected one that cleansed me of all my bad luck) from a side shrine area and then further nourished my soul with the soothing smoke of the jyou kou ro - incense eternal burner. There are plenty of nice souvenirs to buy and I would encourage it. 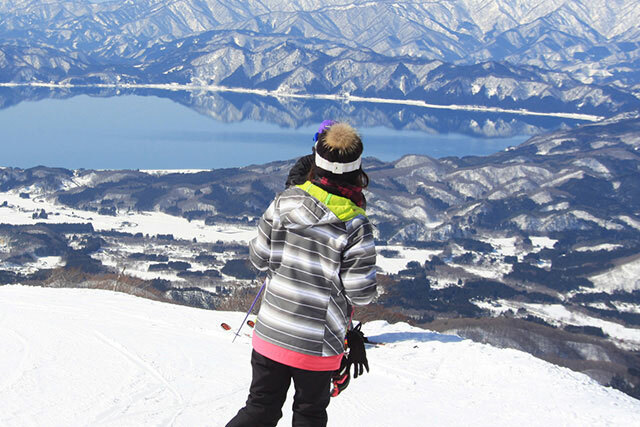 There is so much for a person to explore along the Nakamise shopping area. The shop designs are actually helpful in that many of the shops that sell similar items are located adjacent to each other. The ranges of items you can buy in Nakamise's more than 80 shops include everything from kitchen utensils to some pretty unique old fashioned billboard signs. I was also delighted by some of the rather unique architecture which added to the color and character of the area. It seemed these structures were just as much an attraction as were the shops. 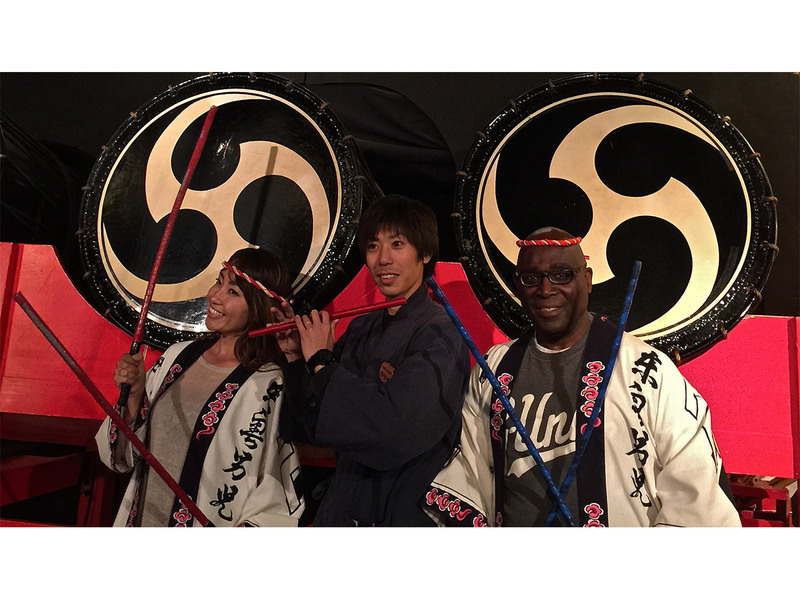 One of the clear highlights for me in Asakusa was my visit to a photo studio where I got to wear a Kimono. Since I knew very little about how to select which Kimono to wear, I found it very helpful that the staff at the shop were very adapt at picking out just the right combination! I have to admit, the transformation was simply extraordinary! With each layer that was added, I could feel myself thinking back to a time when Shoguns ruled. I thought to myself, This is so cool!" I now know how Tom Cruise felt in making the film, "The Last Samurai!" Just when I thought nothing could make my kimono experience better, I walked outside the photo studio to see a Jinrikisha rider from Ebisuya Kaminarimon waiting to take me and my travel colleague - Ami Haruna - off on a journey that truly has to be experienced to be appreciated! The title in Japanese tells it all: jin person + riki power + sha vehicle. A very athletic and strong runner uses human power to propel the two-wheeled vehicle and its passengers around various cultural hotspots in Asakusa. Don't forget to ask for a discount ticket for your next ride! You will come back for more! With so much to do in just a morning visit to Asakusa, it is not too hard to work up an appetite! 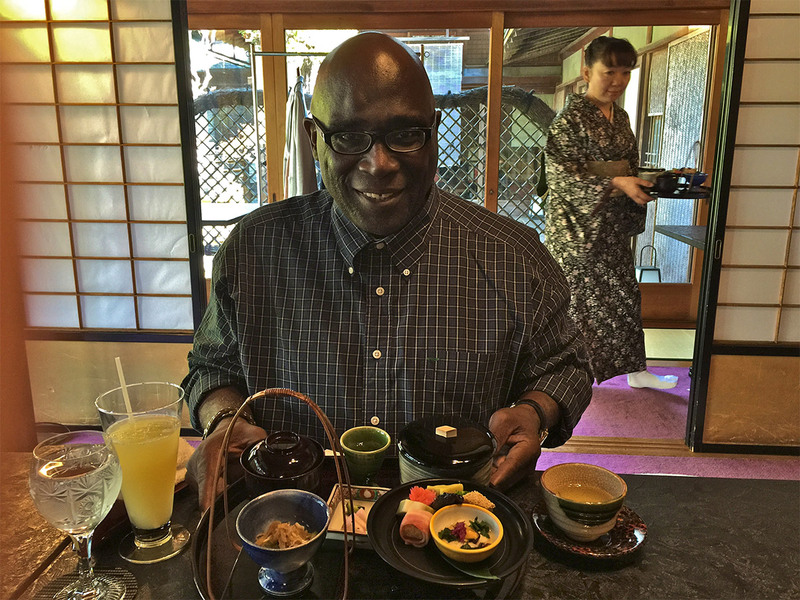 After taking in all the wonders of the traditional Japanese culture of the area, I could not think of a better way to celebrate this than with a lunch meal of sushi at the Sushisei restaurant. The first thing you will notice about the menu is that the prices are very reasonable! The second most notable thing besides the delicious entrees, is watching the sushi chefs ply their trade in both an entertaining and informative way. They were also friendly pose for pictures! After the lunch, we walked a bit to Kappabashi Kitchenware Town. It was a bit of hike with heels so I recommend you wear comfortable shoes. 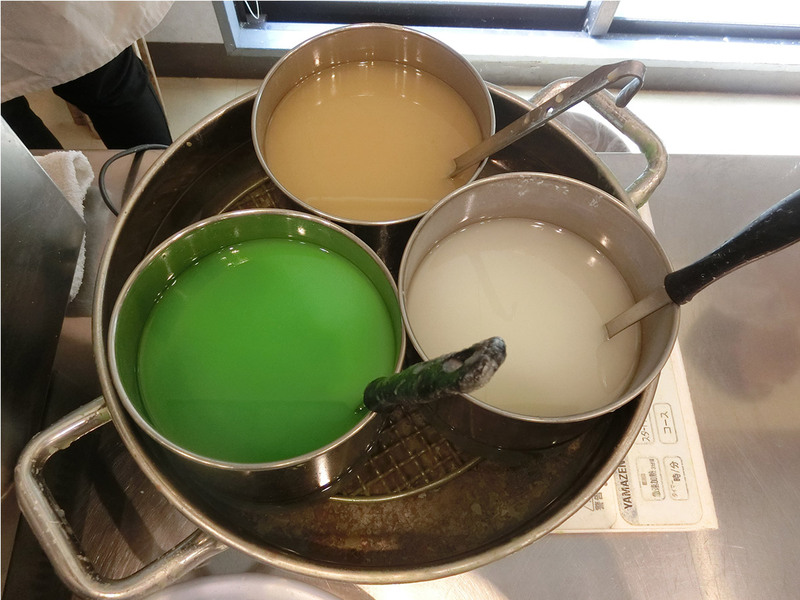 At Kappabashi Kitchenware Town we made display food with colored wax. I made shrimp tempura and cabbage! That was a lot of fun! I didn’t know I could do this so easily. I think I saw someone making wax lettuce on youtube but never thought I’d be able to do it. It was very easy with the teacher’s help! Walking back to the train station to get back to Shibuya was such a hike!!! Especially with me not knowing which direction to go and my Google Maps not working with no wifi. I would recommend taking a cab to Shibuya if you are a group of 4 people, it will end up costing same. I think we walked about 10-15minutes to the train station then we were on a train for 20min or so to get to shibuya. 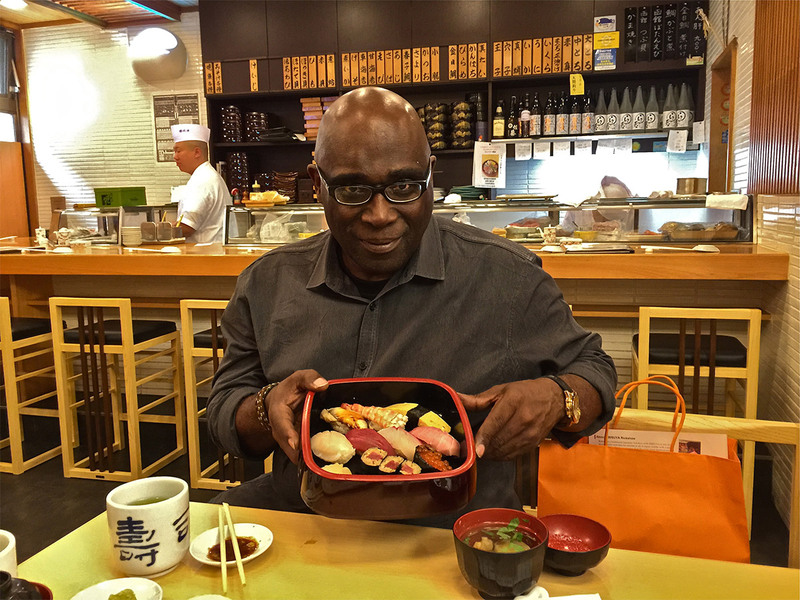 I think it was a great idea for me to have sushi lunch at the Sushisei restaurant before I visited Kappabashi Kitchenware Town. That is because a visit there will make you hungry if you happen by one of the replica food shops. The food on display looks very appealing. There is only one thing - it can't be eaten! What you can do is make your own! 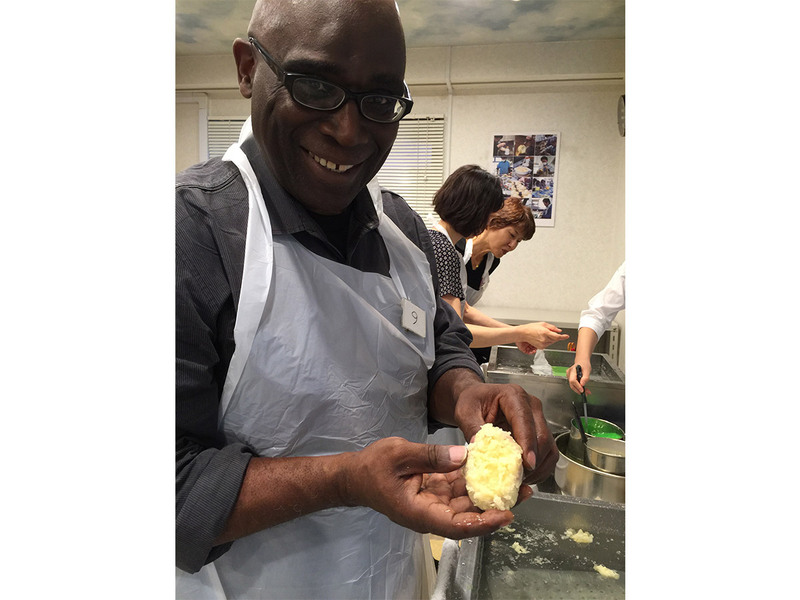 As a person who prides himself on being a good cook, I was eager to see how well I would do in the replica kitchen. It was so interesting to make tempura shrimp and sweet potato but my biggest surprise came when I got to make lettuce. Now… one of my favorite towns is Shibuya! I wrote about 109 before in my blog, but this town is my all time favorite since I was little! I went to shop at 109 again this time to be ready for Aomori, as the guide told me I would be walking a lot. Also Aomori is cold already in October so I wanted to have warm clothing. Within 30min of being at the 109, I came out with $16 warm shoes and a $20 jacket! I love this department store so much!! 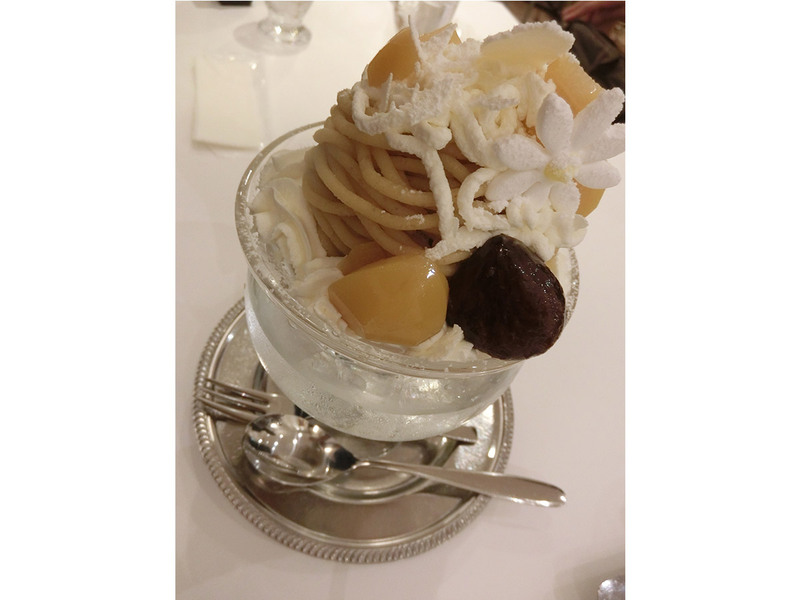 But our main reason of coming to Shibuya was to eat at Fruit Parlor ! 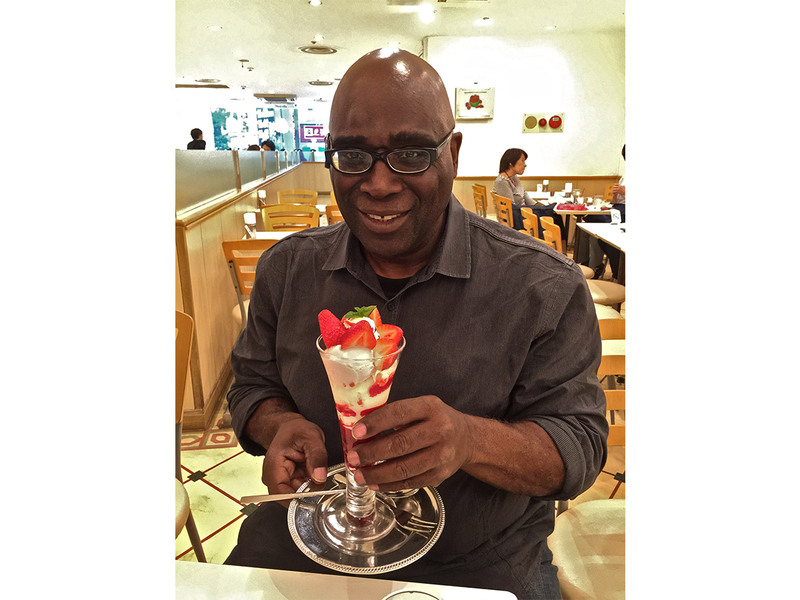 Look at these size of the parfait ! This is the best place to meet up because it’s never really packed and it has such amazing fruit parfait! The mont blanc parfait was amazing. Wow. Agh, How I’ve missed Tokyo..!! 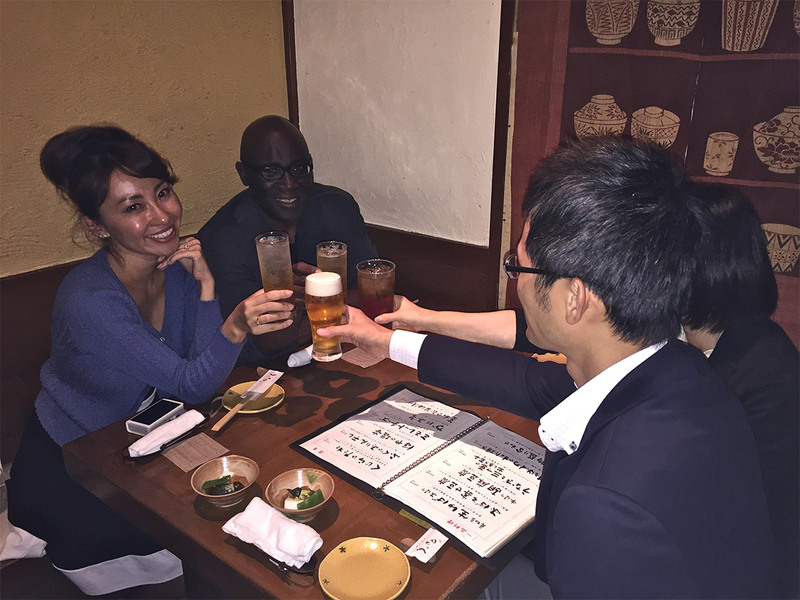 Time for some Kanpai (“Cheers” in Japanese)! After we finish off the parfait, we are moving on to the dinner. Haha! Yup Eat eat eat! That’s what I do when I visit Tokyo! The dinner was pretty good, I love the Japanese pickles and these local Izakaya! 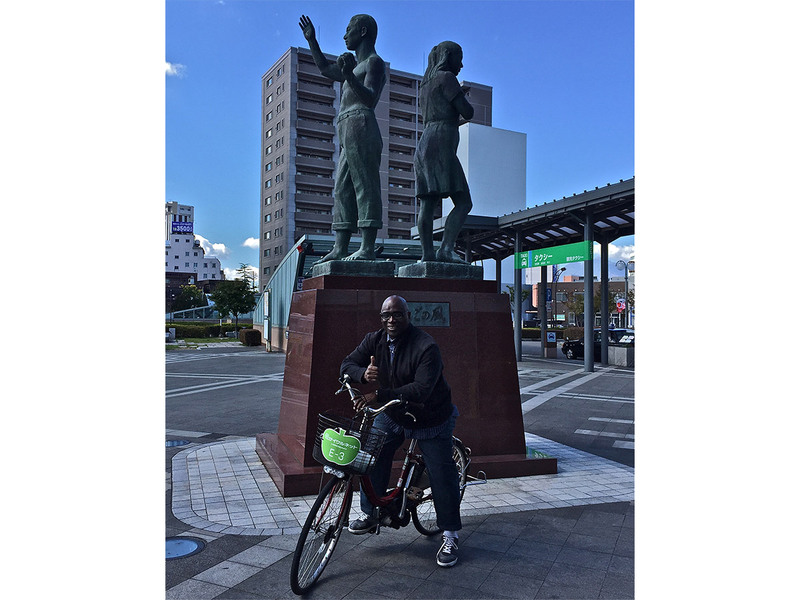 With a satisfying visit to Asakusa under my belt, I turned my attention to the Shibuya and Harajuku area. I think the subway is the best way to navigate between Asakusa and Shibuya. Once you get there you can spend hours just walking around to the various clothing, specialty and unique shops that are plentiful and very customer friendly! However my desires turned to something else that is particularly famous in Shibuya, and that is what I call the sweet shops - pastries, cakes, pancakes and donuts. 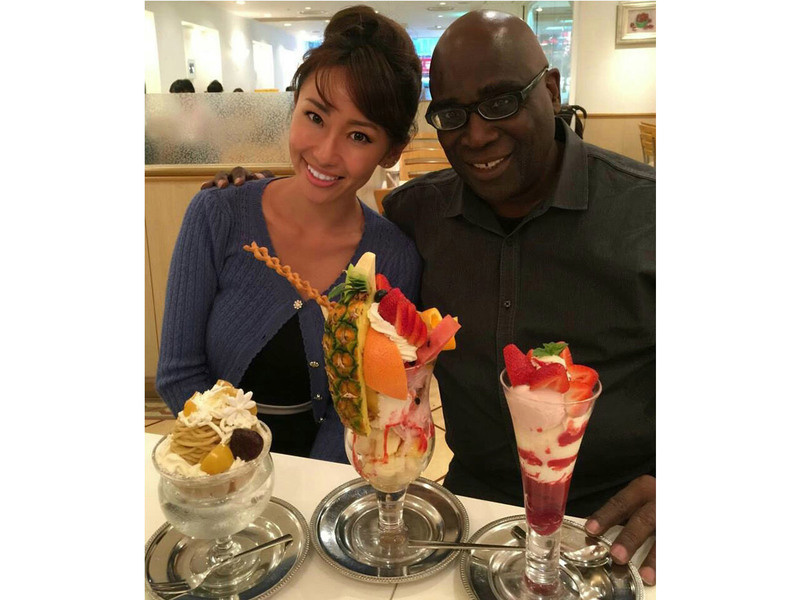 I choose to go to the Nishimura Fruits & Parlor where the specialty is mouthwatering ice cream and frozen yogurts! 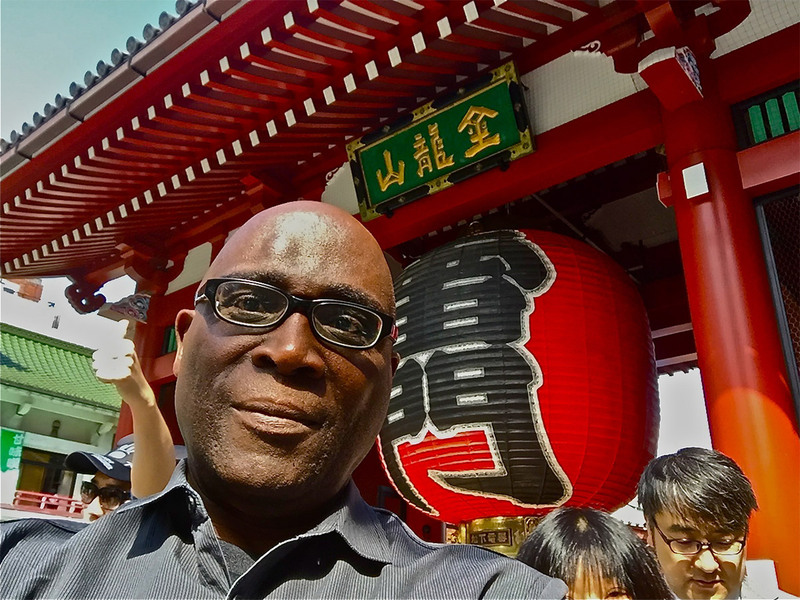 A trip to Japan presents a chance to dine in some of the finest seafood restaurants in the world! Finest doesn't always mean it has to be expensive. That is especially the case for a traditional Japanese izakaya - or casual restaurant. I chose to have dinner at Shunsai-semmie Unosato after a afternoon of shopping in Shibuya and Harajuku. In any izakaya, there are many entrees to choose from. Since I was in the mood for fish I choose that but the restaurant had everything from yakutori chicken to pickled vegetables! The other excellent thing about an izakaya is the very good saki and draft beer that will always be available. 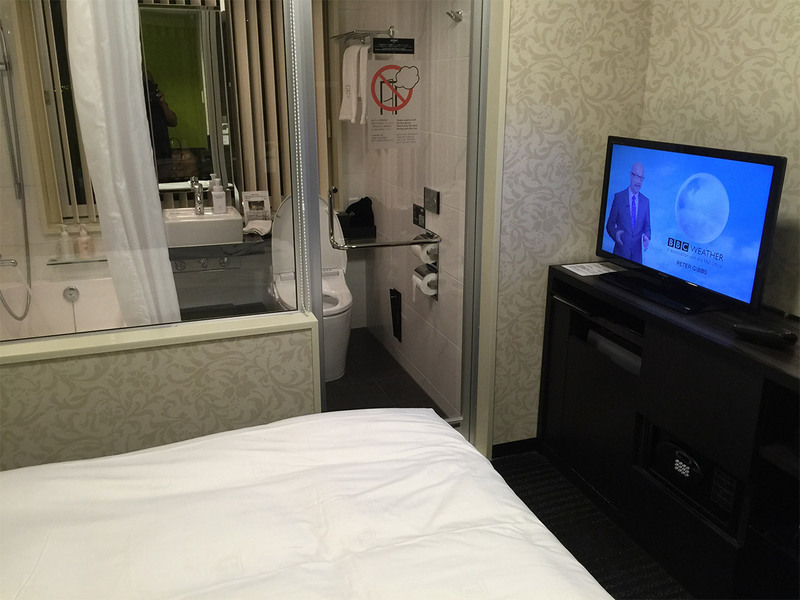 With my visit to Tokyo finished, I took the train from Shibuya to Tokyo's Haneda Airport where I checked in to the Royal Park Hotel. The hotel room was very comfortable and had some nice amenities including some cable television and free WiFi. If you arrive early in the evening, there is a pleasant bar/restaurant conveniently located and a wake up service to ensure you catch your flight in plenty of time. The morning breakfast is standard hotel fare but I only wanted a lite meal anyway. 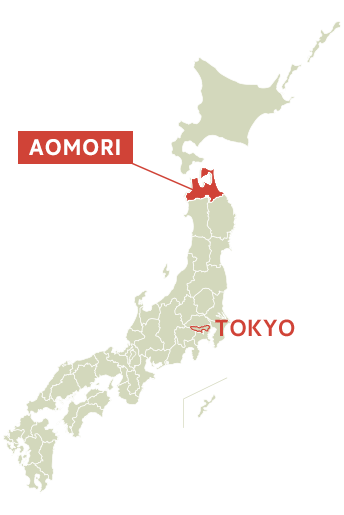 First of all, Aomori is in Touhoku district and it was almost a １ hour flight from Haneda(Tokyo) airport. We took JAL to get here and JAL was awesome, as always. 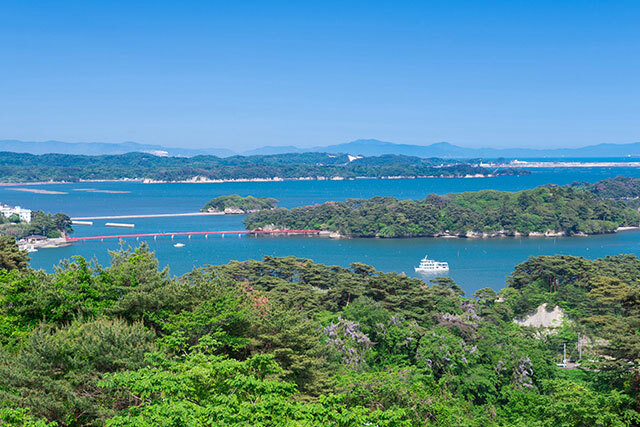 A comfortable flight with JAL from Tokyo's Haneda Airport to the Aomori Airport takes just a little over an hour. 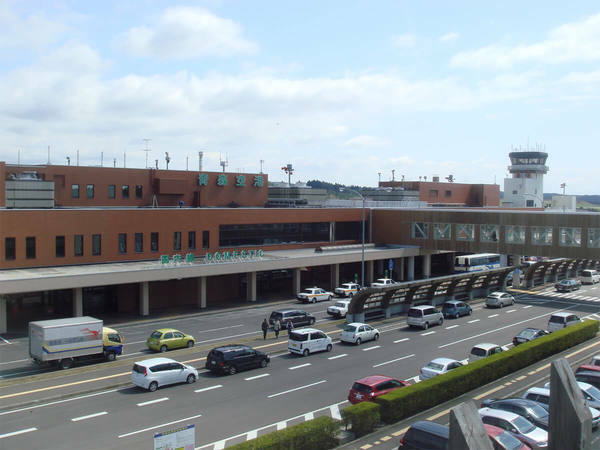 Once we landed was convenient to take the shuttle bus from the airport to Hirosaki Station. 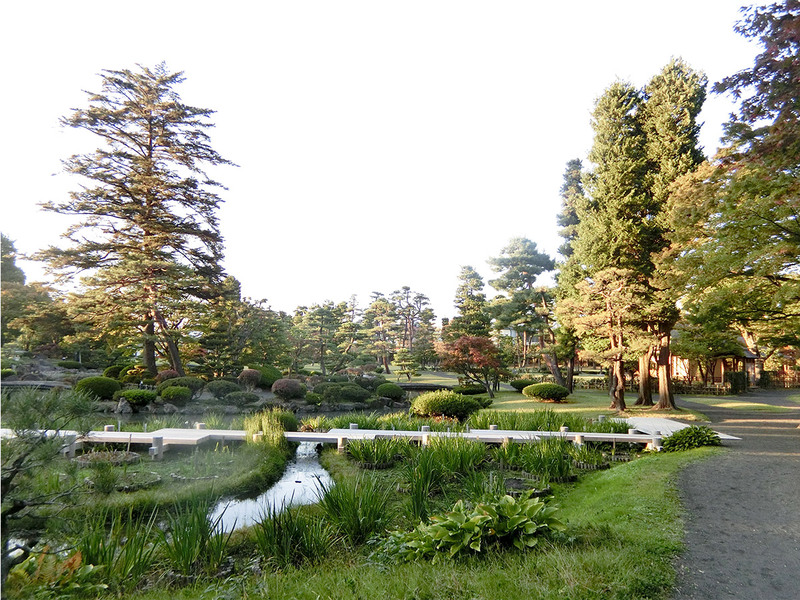 The first stop on my itinerary is the Hirosaki Castle Park. You can get there by 100 yen bus from the nearest station. But if the weather is fair, I would suggest a better transportation mode - bicycle! There is a bicycle rental shop at the station for both conventional bikes and motor powered bikes. The price is reasonable and it gives you a really nice way to see the city! 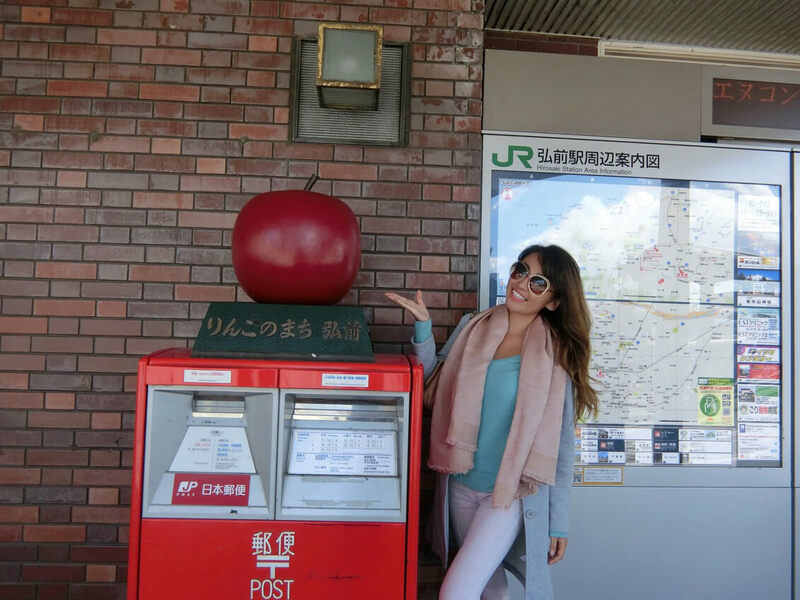 If you need a reminder of one of the biggest attractions in Hirosaki you need only look to the post office box outside the station, which has a giant apple adorned on top! 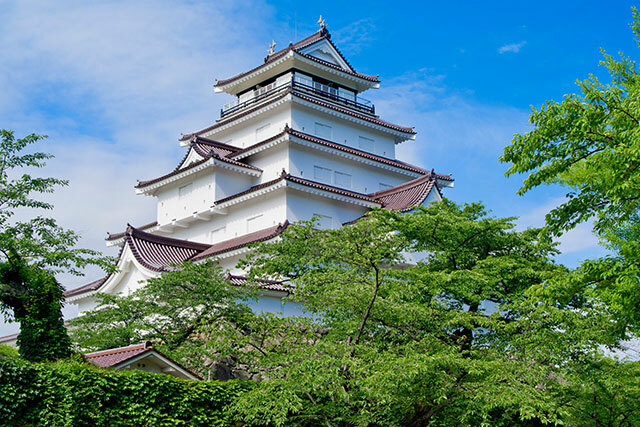 Hirosaki Castle, on which construction began in 1603, is a rare and precious architectural structure in Japan that can still be seen today. 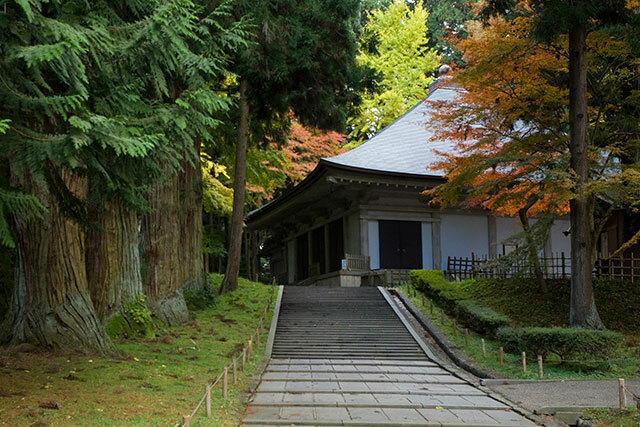 Visitors can enjoy Japan's four seasons in this park, including the Cherry Blossom Festival in spring, the Chrysanthemum and Autumn Foliage Festival in fall, and the Snow Lantern Festival in winter. My Pocket Wifi Broke! So, Yea. Um. I was going to freak out. 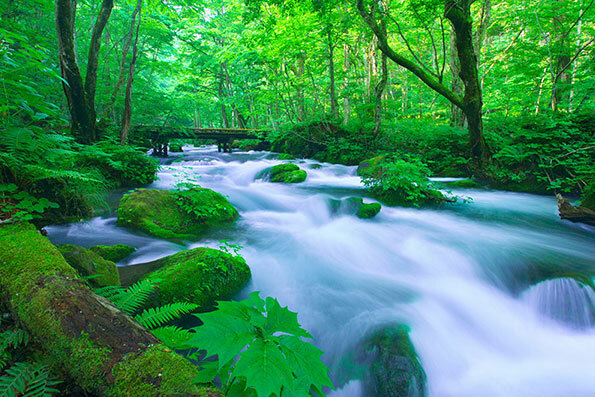 Looking back it was a blessing in disguise as it let me pay full attention to the beautiful nature all over Aomori. 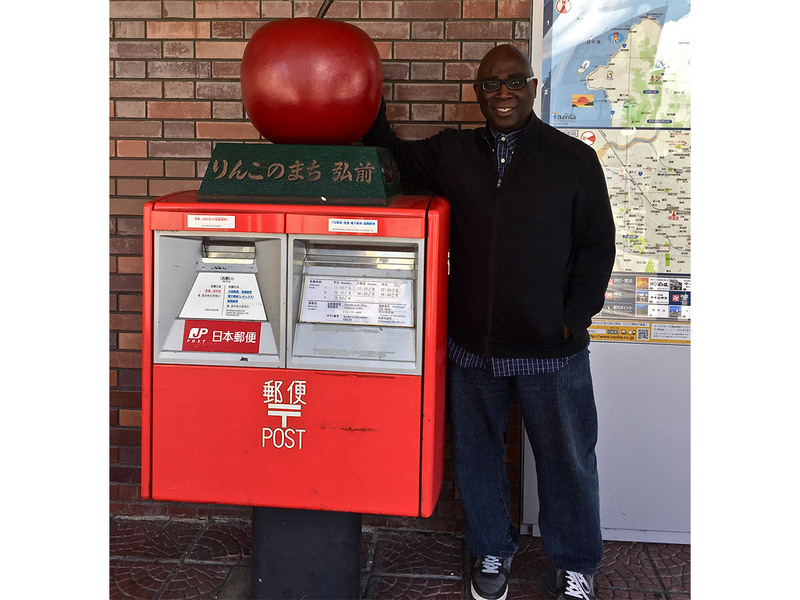 When we got to Hirosaki station, we realized there was a big apple on top of the mail box! How cute is that! 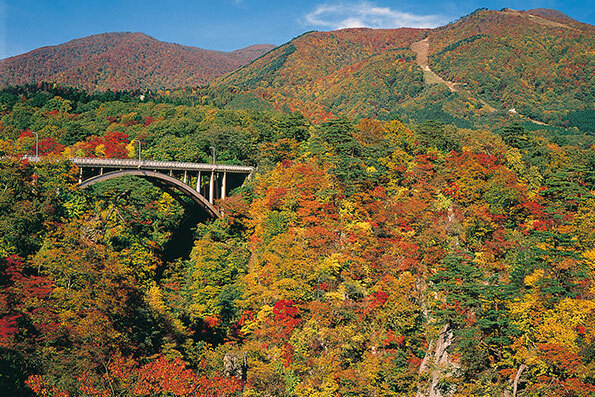 Aomori is known for their apples if you didn’t know. There are several option for touring the city. One option is to hire a cab, which is around $60-80 for entire day. A second option is to take the train and busses but I think it’s a bit difficult to do unless you can read Japanese Kanji or Chinese characters. Lastly, renting an electric bicycle for 8hours is ８＄（￥1,000）. We decided to rent an electric bicycle. Now we have our bicycle, we are off to the Hirosaki Castle ☺The Hirosaki Castle is in the middle of moving. 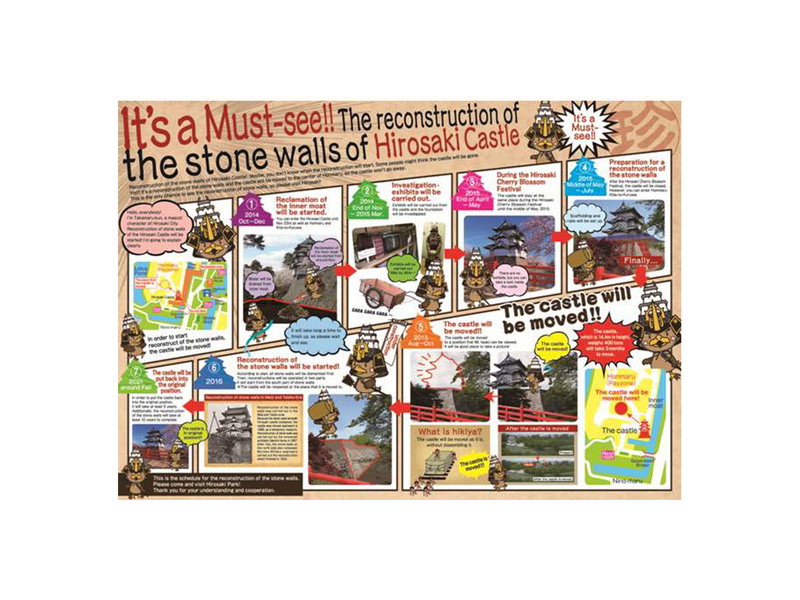 Yes, They are moving the 400 ton castle approximately 230ft for reconstruction of the stone walls. The relocation is taking place so that the city can dismantle and rebuild the stone wall, which was showing signs of aging. This is the first time in about 100 years that the stone walls beneath the castle are being reconstructed. It will take around 10 years to complete all of the repairs. After the stone walls are completely refurbished, the castle will be moved back to its original location. The entire procedure is scheduled to end sometime around 2021. Every 100 years or so, they must rebuild the stone walls beneath the castle. Now, it’s time for Lunch!!! We came to Suimeisou for a Kaiseki style lunch. 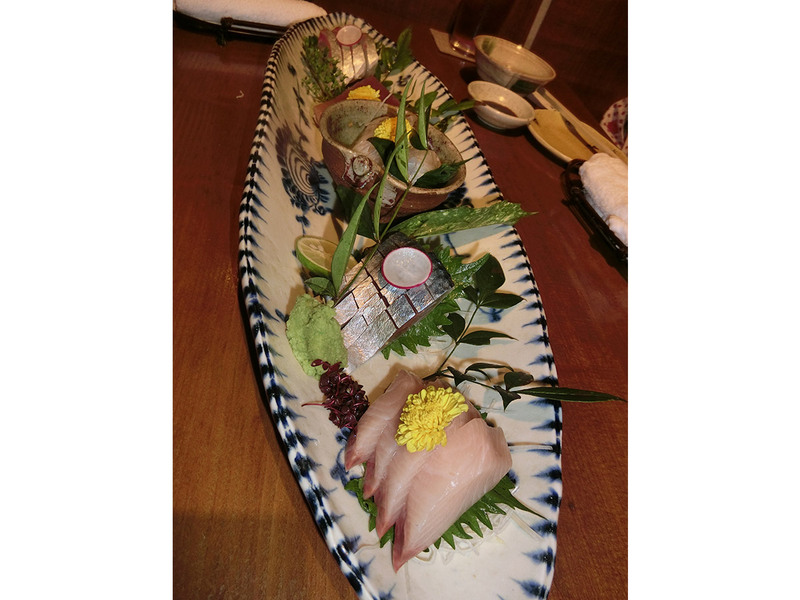 Kaiseki is a traditional multi-course Japanese meal. The courses include various dishes in very small potions. 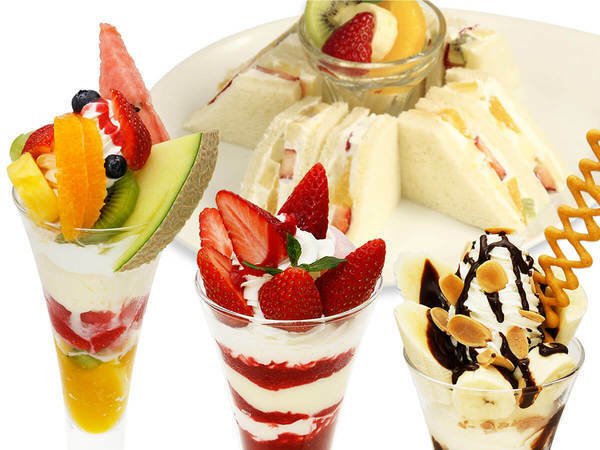 How the food is presented is very important. 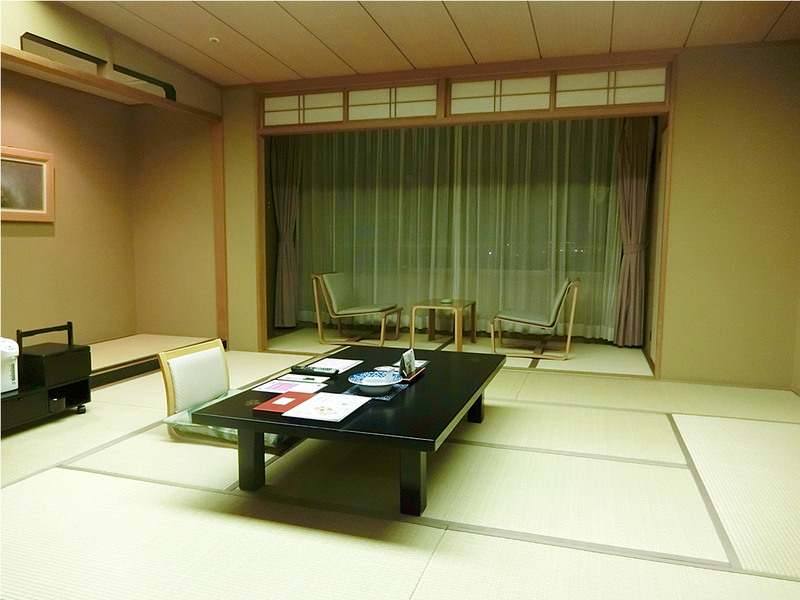 This restaurant has 8 private rooms and all of the rooms have a Tatami style floor. They also have a table and chairs so if you are not used to sitting on the floor, they have the option. The restaurant has an amazing Japanese garden that you can actually go out into, also! All the staff wears Kimono so for the visitors that want to experience the traditional Japanese style cuisine and atmosphere, I recommend you come to eat here! The next stop is Lacquerware store! 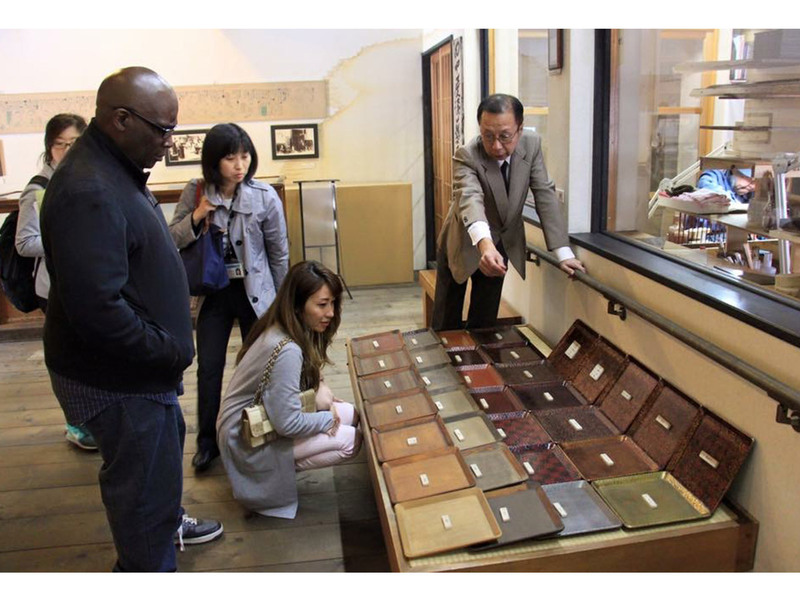 Tsugaru Lacquerware has over 300 years of history. 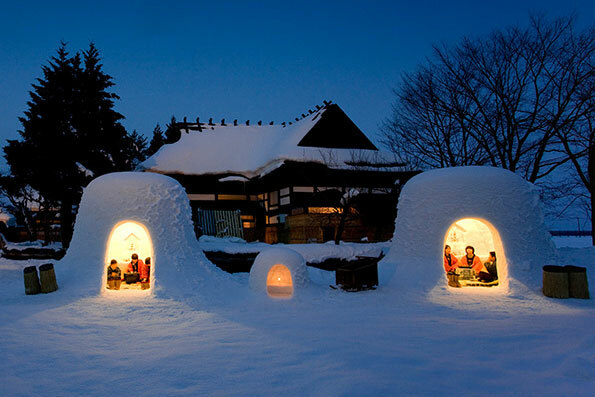 It is one of the examples of the traditional art crafts in Aomori prefecture. Tsugaru Lacquerware is main created and sold in Hirosaki city of Aomori. It has to be coated with lacquer liquid over and over, and then sharpen on a whetstone to make the patterns. Each piece of artwork takes over two months to complete because of this process. You can see the artisans making something at the store as well. The chopsticks and the bowls are the most popular items. They also have furniture and many other items. My travel partner during our time in Aomori, Dan, bought a business card holder. 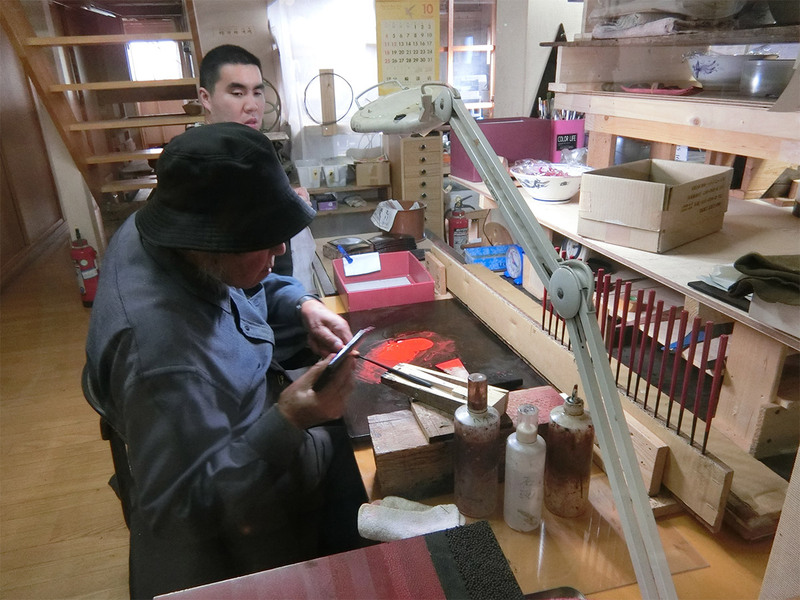 It is impressive to see the artisans making the lacquerware, and to learn how it is made. I knew of lacquerware and even own a few pieces such as bowls and dishes. I didn’t know how it is made or how expensive they are. Going forward I now know the value of lacquerware and will treat them differently than before my trip. 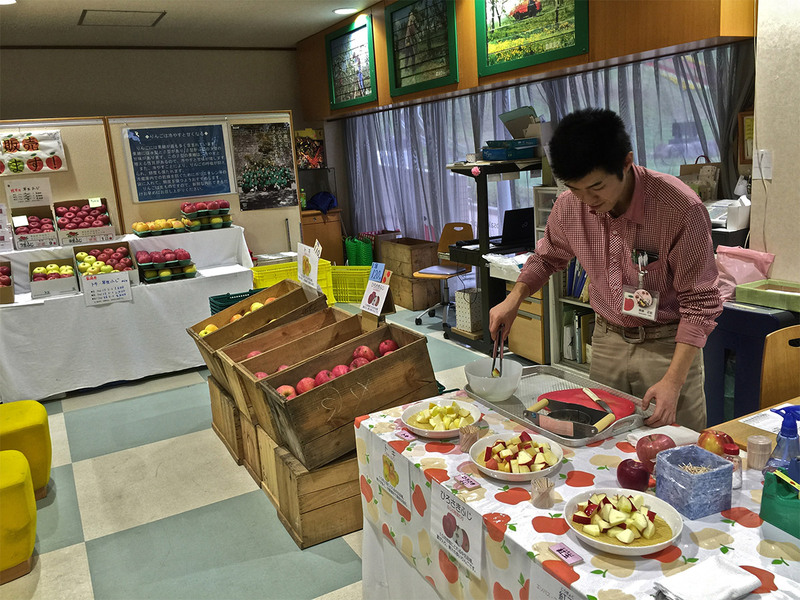 As I mentioned before, Aomori is known for their Apples and they produce 50% of all the apples in Japan. 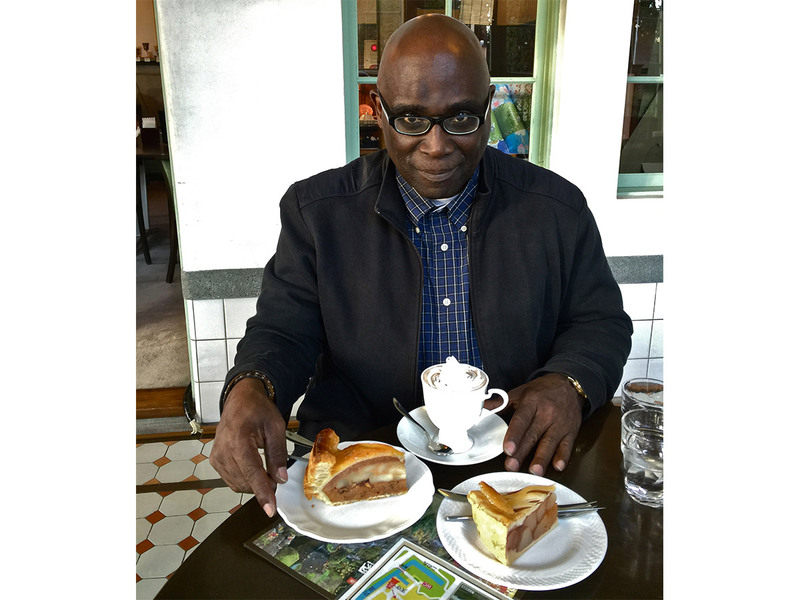 So we came to try a couple of different kinds of apple pies at Fujita memorial park’s café. It used to be Mr.Fujita’s house and now it is an important cultural building that has been transformed into a café for everyone to enjoy. There is a drink that is half Apple Juice and half tea, I’ve had apple tea before but this is like an Arnold Palmer and it was very refreshing! I might have to copy this at home too! 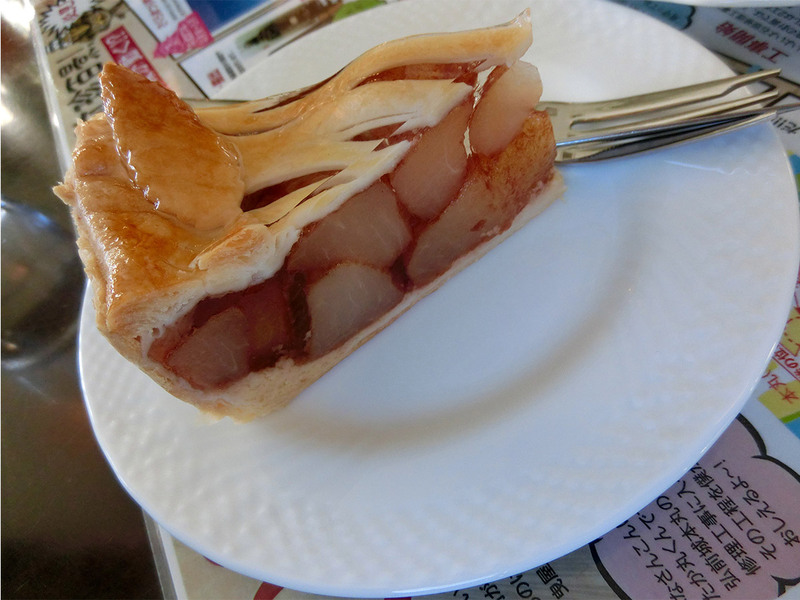 Talking about apple pie, the Hirosaki city offers over 40 kinds of apple pie! But in this café, there were 6 different kinds and you can take them home too. After eating apple pies, we are heading to see the garden. It costs $2.50 to go inside the garden but it is so worth it! There are a lot of gardens in the Los Angeles area I live in—and a lot of them are not as well maintained as this garden and costs $10-20 just to get in! So I couldn’t believe how pretty the garden is and how inexpensive the entrance fee was! Unfortunately we didn’t have enough time to look around completely so we browsed around for only 10 minutes and we were off to our hotel! The great thing about traveling around Hirosaki City by bike is that you can also ride your bike to and inside of Hirosaki Castle Park. That will give you more time to observe more of the sights inside the park. 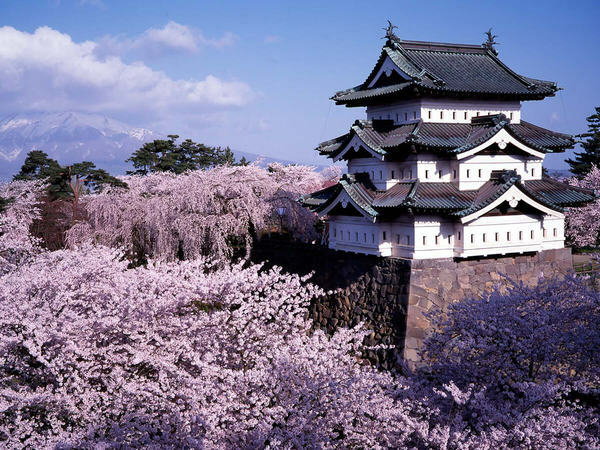 The most impressive site is of course the Hirosaki Castle. The castle is surrounded by three moats! It originally stood at six stories tall but was destroyed in a fire in 1627 with the current three story castle being rebuilt in 1627. The castle walls are being restored resulting in a pretty ingenious plan that has moved the entire castle to a temporary location 70 meters away. 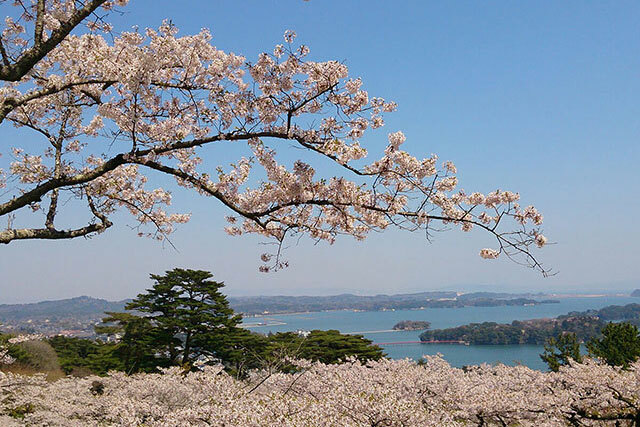 During Cherry Blossom season the park's 2600 are a majestic sight! 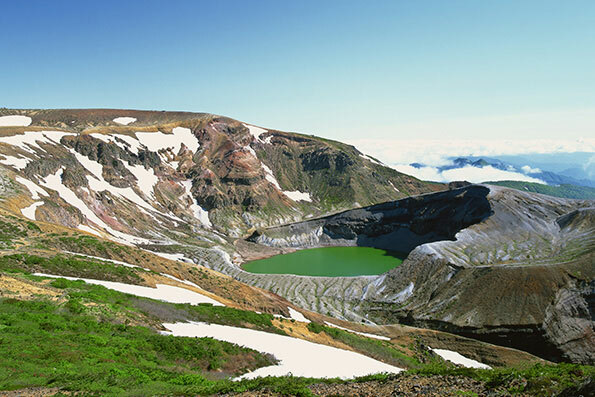 There are many pleasant surprises to be had anytime you can get out to any of Japan's prefectures and Aomori is no exception. 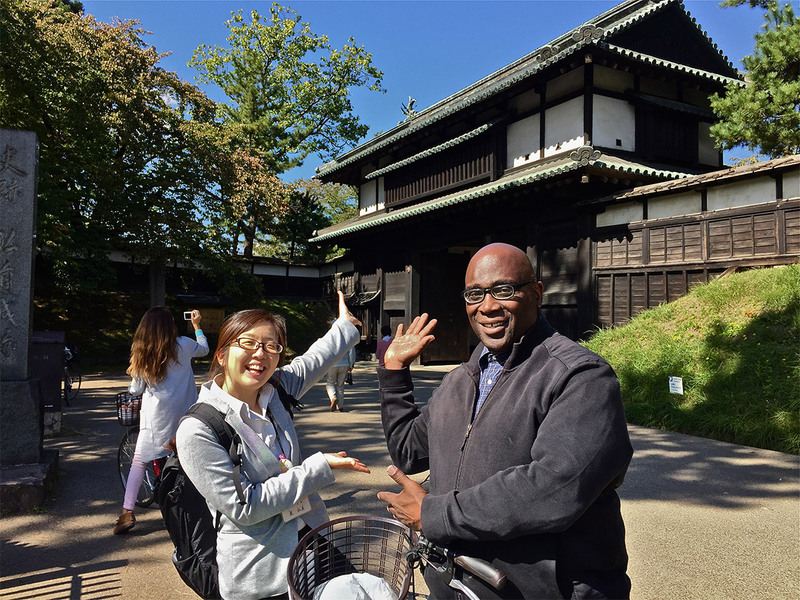 Just a short bicycle ride from Hirosaki Castle Park our group found the prestigious Japanese restaurant Suimeiso! 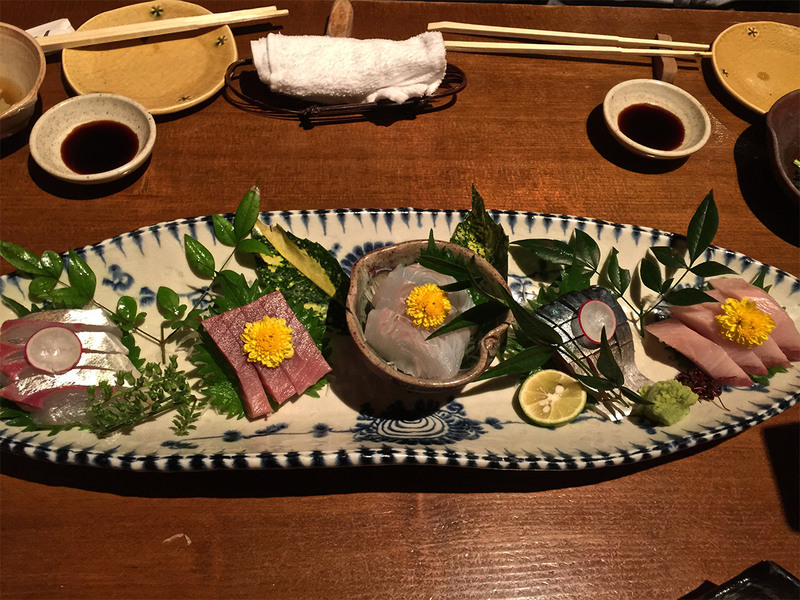 Its majestic traditional Japanese setting and the course meal that I had was a visual and a delectable masterpiece! The attention to detail in the meal preparation almost made me want to just marvel at the sight of the dishes. 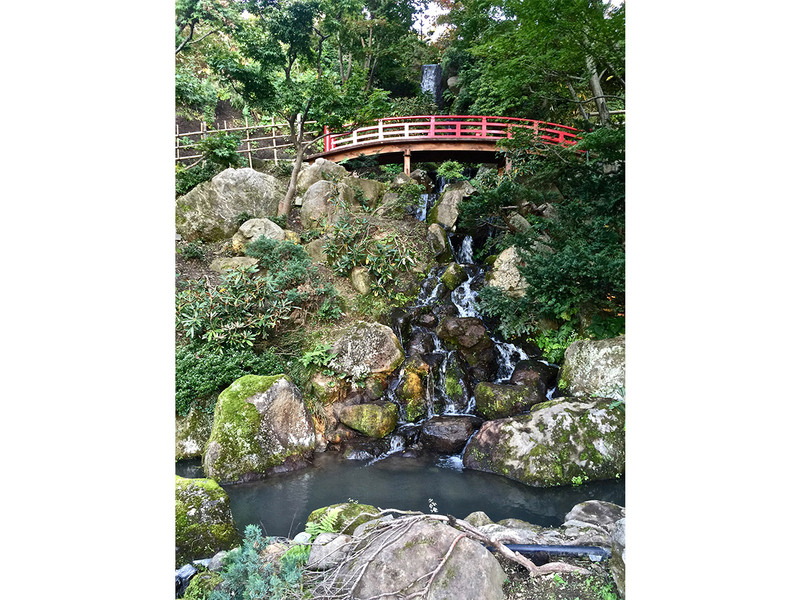 But I manage to take some nice pictures, consume my delicious meal, and also pay a visit to the quaint Japanese Garden that is part of the restaurant. The ease with which I am able to get around Hirosaki City by bike also gave me time to make some stops to observe unique craftsmanship on display in many shops. 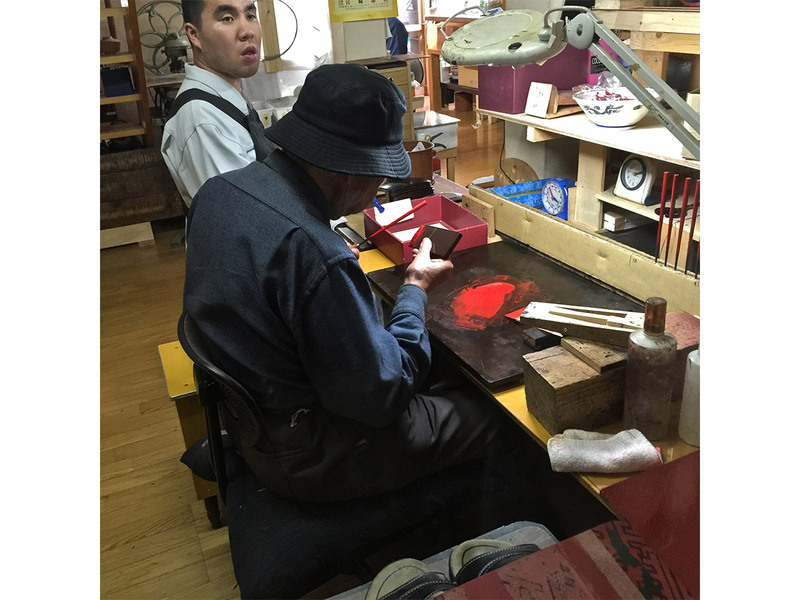 One of those stops was at the Kokusan Tsusgarunuri Baiten Lacquer Ware store and factory. 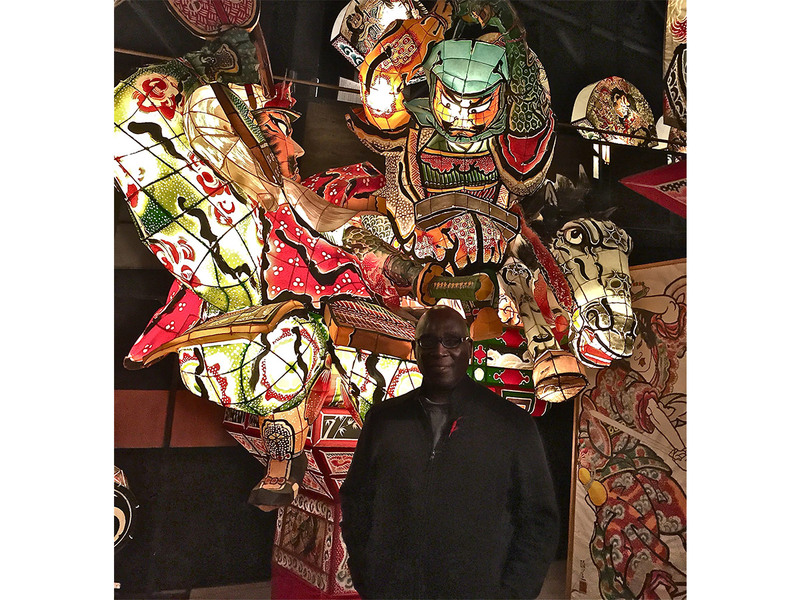 There I was able to observe a family business that was steeped in tradition and history. Through a window you can actually witness live work going on and observe the painstaking process it takes to create many of the cultural gems that are coveted from small mementos like business card cases or chopsticks, to commissioned works suitable for homes and offices. The great thing about being in Hirosaki City is that you are never far removed from the influence the apple trade has here. I am talking about the wonderful influences in the wide array of items produced to highlight their delicious apples! I took a break to dine on a variety of apple pies at the cafe located inside of Fujita Memorial Garden. But most cafes and coffee shops in Hirosaki will offer you a sampling of apple pies and pastries so all you have to do is just pick one. Whether you have it with coffee, tea, or my favorite, ice cream, it is a nice afternoon diversion. After consuming my fair share of delicious apple pies and pastries at the Fujita Memorial Garden cafe, it was time to take a leisurely stroll through the beautiful park. I say leisurely because the serenity of the park lends itself to one getting back to a real appreciation of nature. 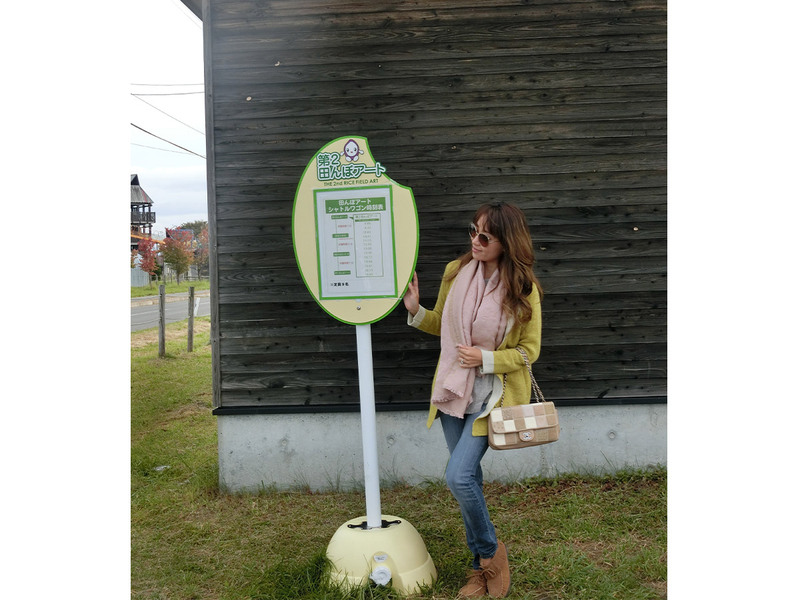 The well-manicured grounds have signs posted in English and are very easy to navigate around. You can easily spend a half day just admiring the grounds. There are several picturesque small ponds and a waterfall that just adds to the tranquil setting. On this day I got to observe the sunset adding to the experience! Our Hotel is called Apple Land and it’s more like a Ryokan style hotel. My room was all in Tatami and it has Yukata for the guest to wear! I have dreamed of staying somewhere like this!! 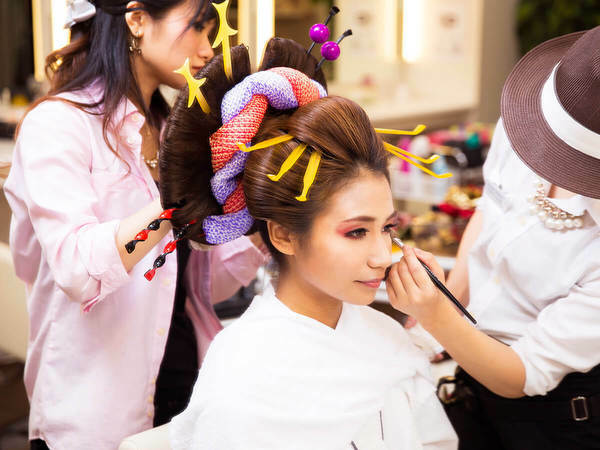 I feel like the country side of Japan still offers these styles but it is becoming less and less available in Tokyo, which is where I grew up. 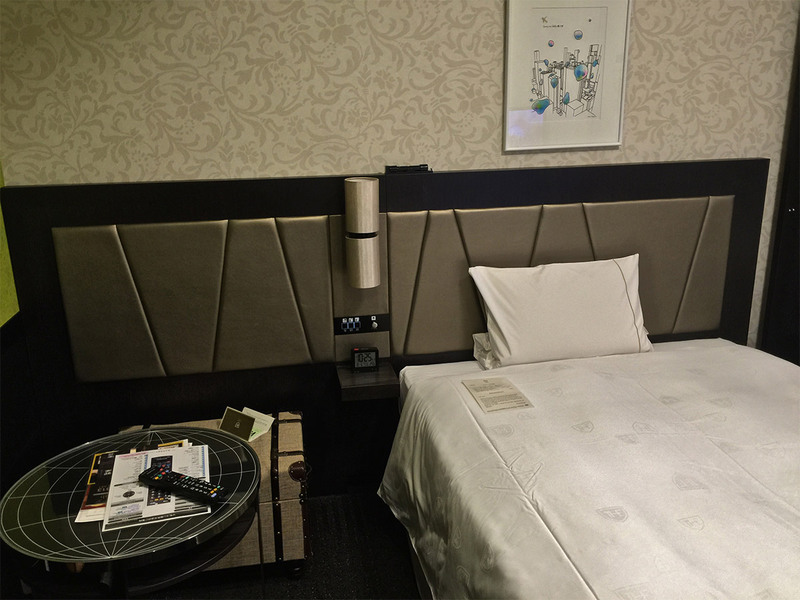 Although I love this style, it is very difficult for me to sleep on the floor so I asked for a bed  The offered rooms with actual beds but they can just bring you a portable bed too. I love having my choices! I chose to have a portable bed set up while I was having dinner. When I came back to the room from dinner, my futon was set up on my portable bed so beautifully! In the Apple Land, they always have a natural hot springs with apples in it!! I would take a picture but in Japan, you go naked in the hot springs so unfortunately I couldn’t take any pictures in there. 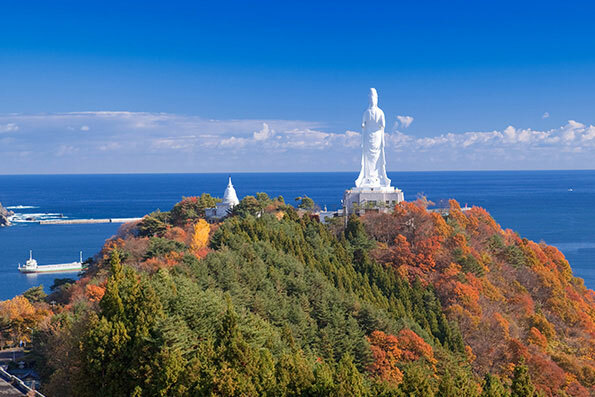 Now my Aomori adventure continues for tomorrow…! Okay can we talk about love now? I am not talking about anything nefarious! I am talking about my love of Japanese onsets! 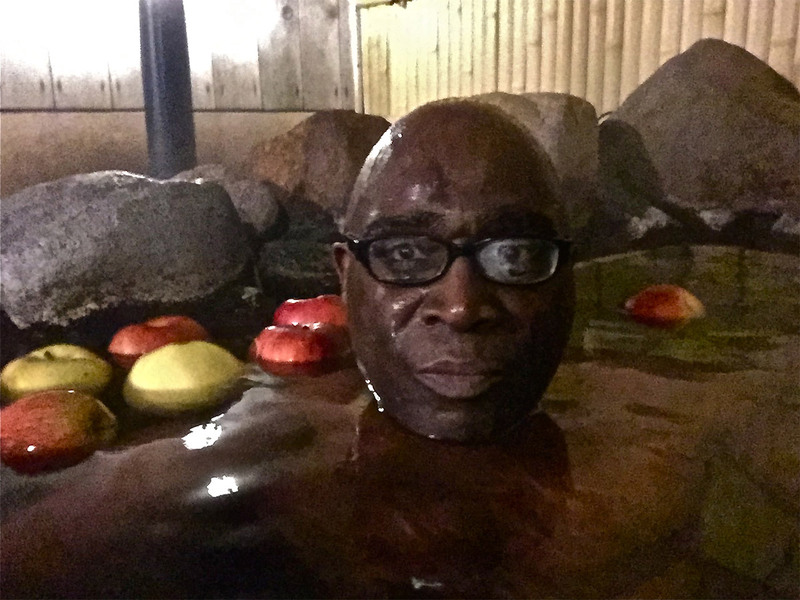 After traveling from Fujita Memorial Garden to my last stop for the day, Hotel Apple Lande, I was in the mood for a lovely soothing trip to the hotel's fabled apple onsen. That's right. 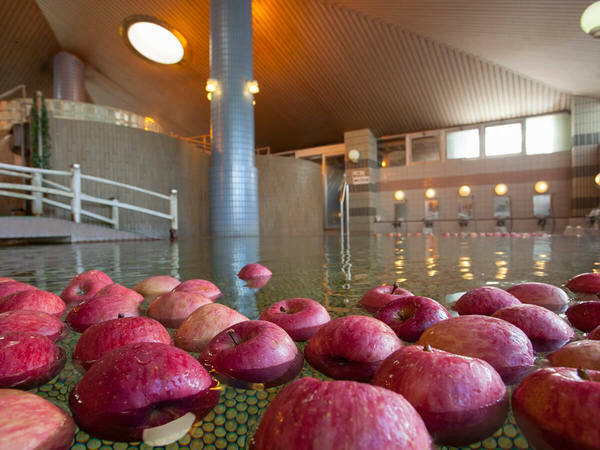 Imagine a nice steamy onsen with the pleasant fragrance of fresh apples and you get my drift. I couldn't wait to slip into the onsen. I ended up visiting the onsen three times over the course of my overnight stay at the hotel! I would resist the urge to eat the apples (I did) and just enjoy the bathing to the fullest. Nothing says Hello" like a welcoming sign at a hotel buffet dinner! That is exactly what greeted me and my travel colleague Ami Haruna at the Hotel Apple Lande restaurant. 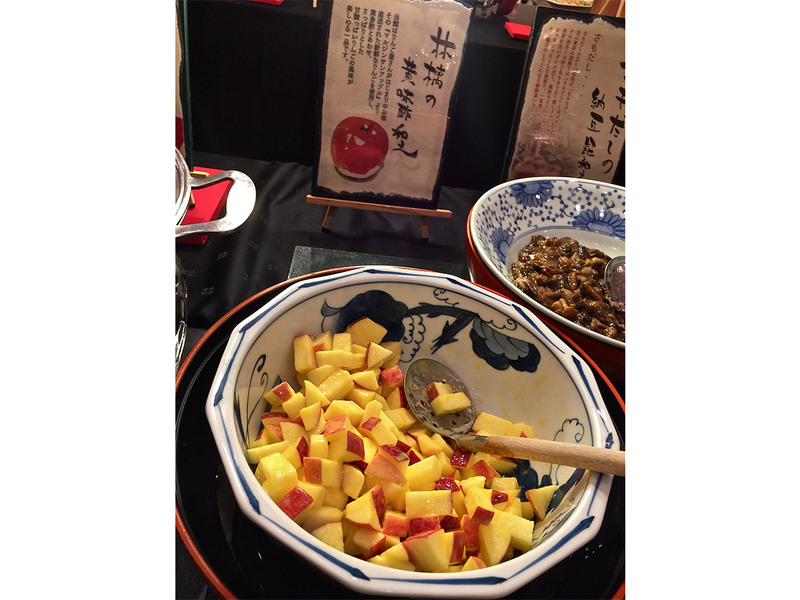 I counted more than 30 entrees that including several delectable dishes introducing me to new ways apples can be used to spice up the regular cuisine. My favorites was a cold apple soup that caused me to make three return trips and an apple and vinegar salad mix that should be a diet staple for every health conscious person I know. I have included it in mine new diet regimen! After my third and final trip to the Hotel Apple Lande's apple-laden onsen, I set out early morning to explore the grounds around the hotel. I had arrived late at night so there was not much for me to see. 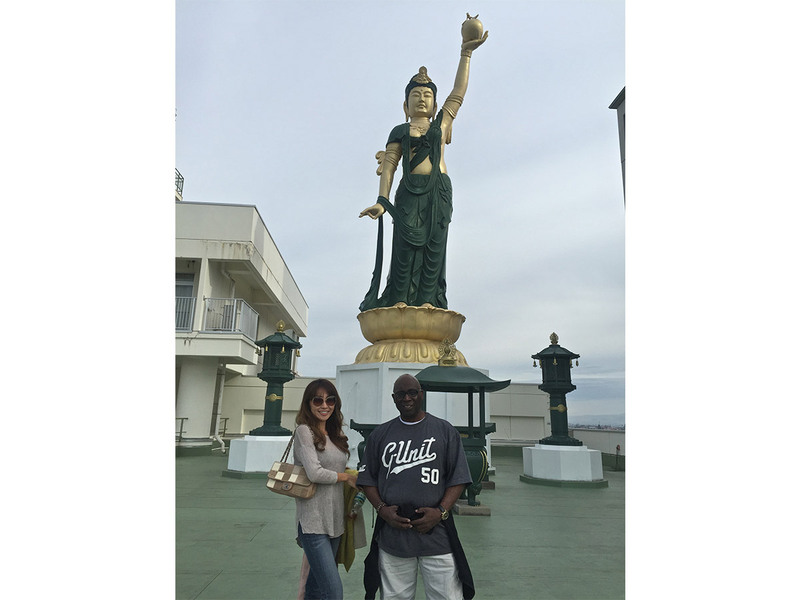 But once the sun was out I noticed a giant statue sitting atop the hotel of what appeared to me to be a beautiful Goddess. it was: Big Kannon -The Goddess of Mercy!' 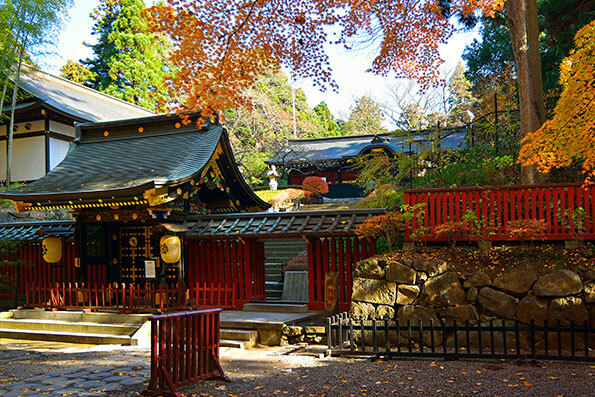 Actually, the temple was a gift to the area, meant to bring good luck and a bountiful harvest. I think it worked. It also brought up a steady stream of hotel guest who were happy to take photos near the statue or just touch it for good luck. Rice paddy art consists of enormous pictures in which rice paddies are used as canvasses and rice plants of different colors are used instead of paints. They have become a topic of conversation due to their high level of precision and artistic qualities. We started off from the Rice field art viewing, it is called Rice Paddy Art. 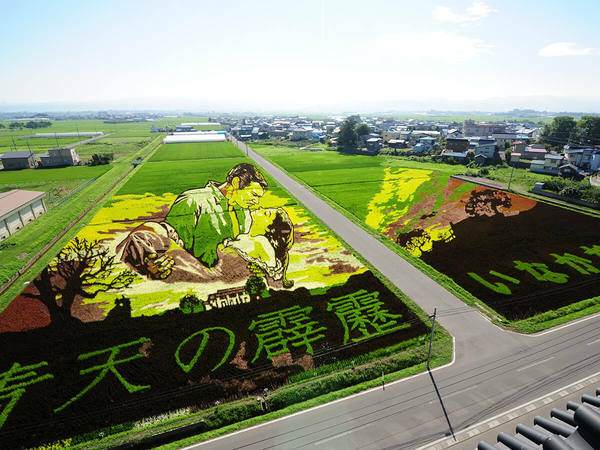 The rice field art started in 1993 in Inakadate village, their population is 8100. Lately it has become a very popular sightseeing spot. 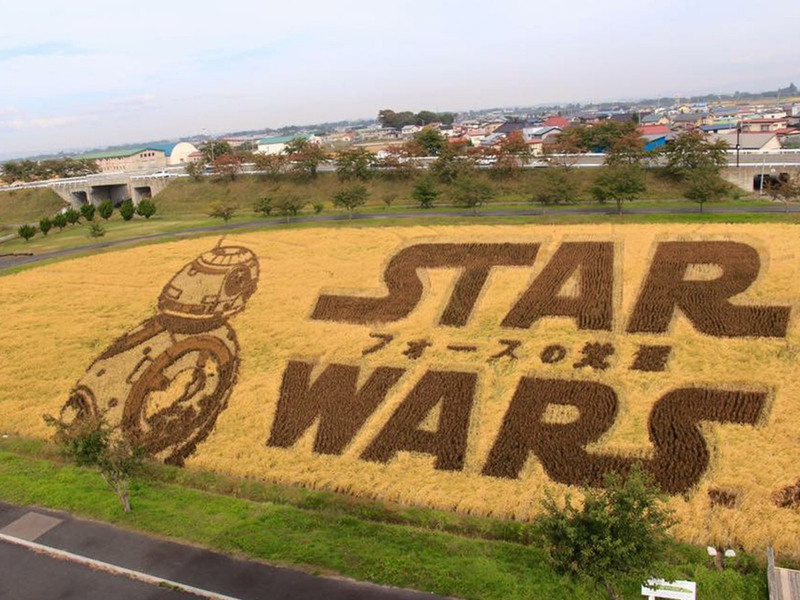 They do 2 different arts every year and this year was “Gone with the Wind” and “Star Wars: Force Awakens.” They use different colors of rice to perfect the Rice Paddy Art, so as the season changes, the rice changes colors to become more detailed and artistry. The entrance fee is only 200 yen ( $1.50) for adults and every year, over 100,000 visitors from in and outside of Japan come see the fields. 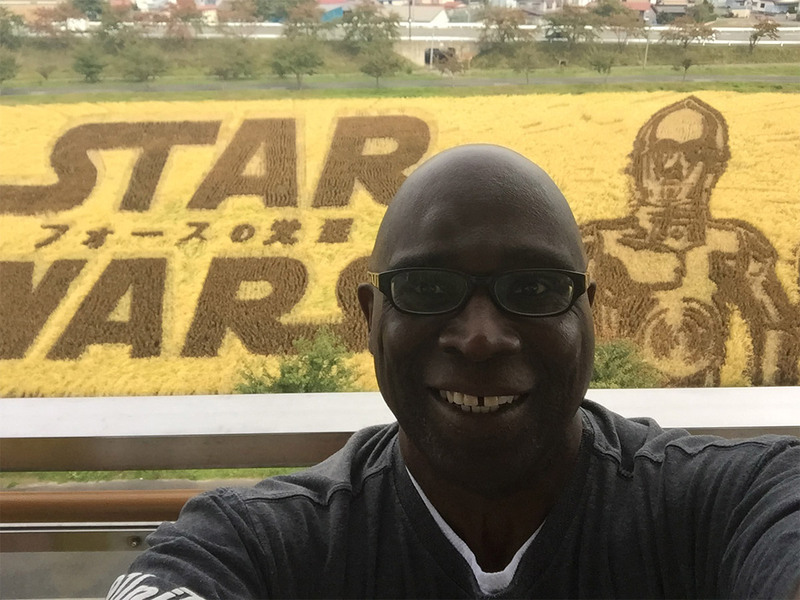 This year’s Star Wars idea was actually from the Lucas Film people, they reached out to Inakadate village to ask them to help promote the new Star Wars movie. I didn’t know much about Rice Paddy Art till the day I got my schedule for this trip. I wondered what the Rice Paddy Art was. 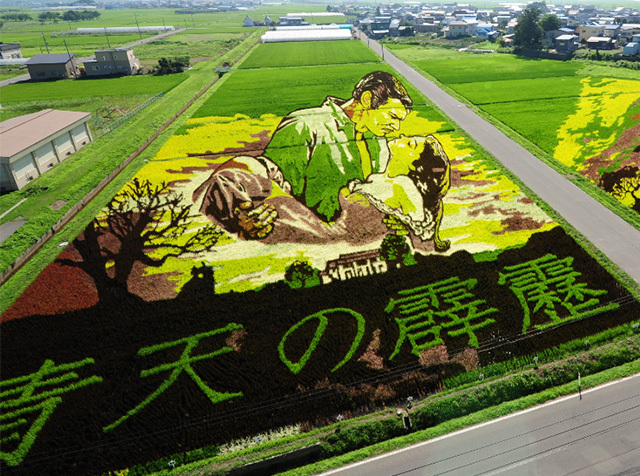 When I saw the real Rice Paddy Art, it was breathtaking. To be at a 2100 year old rice field is one thing, and learning about the culture and history of Aomori made me want to learn more about Japan. 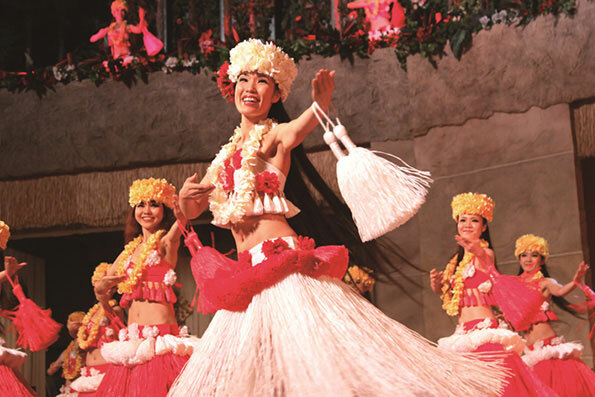 The main purpose behind the creation of the art is for people to learn about the farming and agriculture of rice. I highly recommend a visit the fields and village. They are open between June and October, so be aware of the timing when you plan a trip. The location is a bit inconvenient, you can not take a bicycle as we did yesterday so I recommend you to hire a car for a day and do all the sightseeing on the outskirts on the same day. There is a train and bus to the Tanbo art station but there is no English on the timetable and no one available at the train station to answer questions. Most people come by car or tour bus so it would be challenging to take public transportation here. With the entrance fee only $1.50 and a car for hire at $60-80 a day, it’s amazing deal. 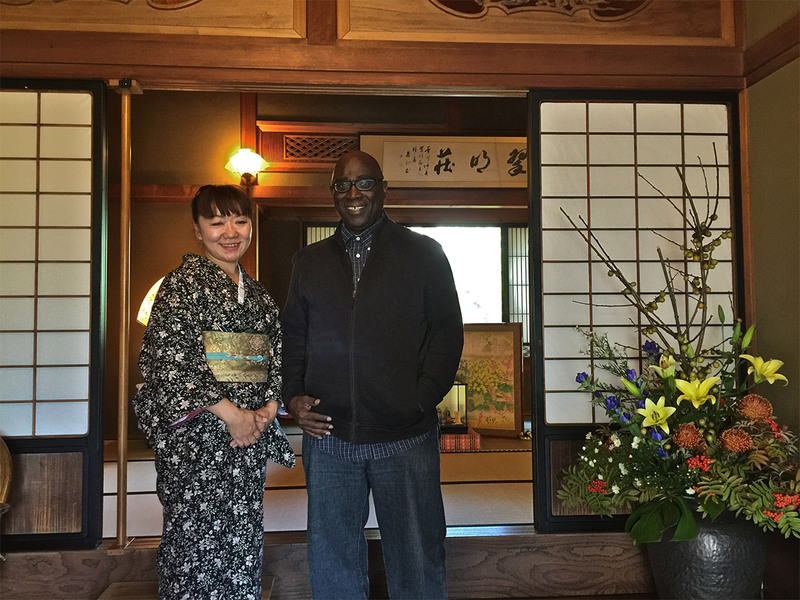 I've talked about several aspects of my trip to Aomori being insightful and informative. Well let's talk about something that turned out to be downright fun! That was the case for my trip to Tambo Station where I was able to observe something I can honestly say I would have never expected to see. It was a living, growing Star Wars promotion! Okay maybe you think I have jumped to another galaxy far away but this one was accessible by train and the view was unmistakable! The story how these artist are able to grow and neuter simple rice crops to produce this and other amazing works of art is astounding! There is no missing the Tambo Art train Station - literally. 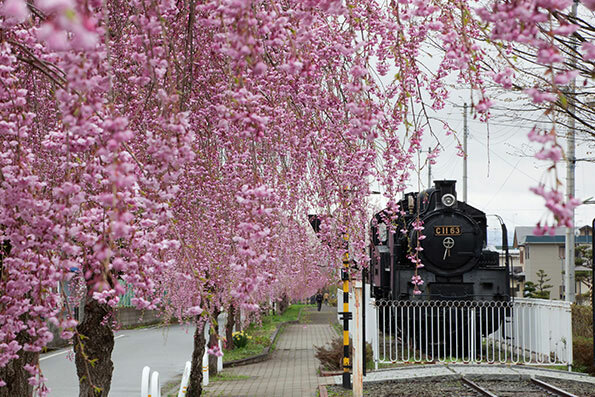 The tiny one-stop train station is literally the one major connection to get by rail to Rice Paddy Art Fields from Hirosaki CIty and making the trip is a bit of a sentimental journey. There are only two cars. You have to be really careful that you don't take the wrong one at the wrong time and in the wrong direction! Once you sort that out, it is just a scenic trip through the countryside. During my ride, several Japanese approached me to ask where I was visiting from. They took great pride in talking about their area. Now we are off to Apple picking! I’ve always wanted to do this, but I know I can’t bring them back to the states so I thought it was a waste to get a lot of apples that I cannot eat. The weather today has not been the best, but it held up and didn’t rain so we were able to pick some apples! We learned how to differentiate sweet apples from ones not ripe yet. The apples that have bumps all over are sweeter! I’ve always liked the bright red and smooth ones just because they look nicer, but I guess I was doing it wrong. From now on, I know what to pick☺　The place also has an apple shop that sells everything and anything to do with Apples. I bought several kinds of apple pies, apple honey, apple jam and a few other apple related treats to take home! You ever wanted to know what it would feel like to be Godzilla? 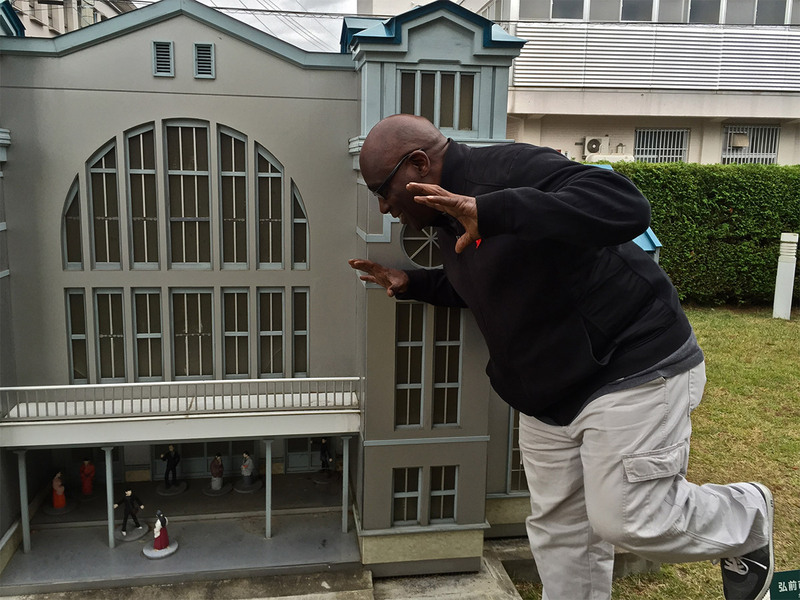 Well I got that feeling with a surprise visit to Hirosaki Miniature Park. It is a rather unique compound of several miniature versions of historic landmarks in Hirosaki all laid out in two rows for visitors. But I couldn't help the giant stalker in me to reenact some of my favorite Giants versus the small people movies and Godzilla is the first one that came to mind. However, I decided to be the lovable giant and just enjoy the amazing minute details of the structures from afar. As a young boy, I grew up in a home that had a couple of apple trees near. 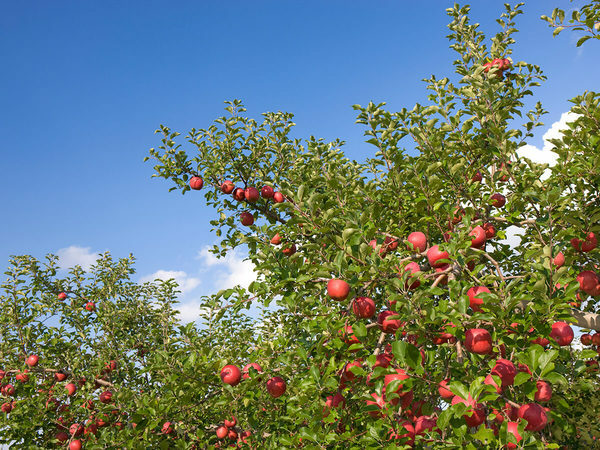 I use to pick those apples and the taste was always a real treat because the apples were so fresh. So to get to do this at the Hirosaki Apple Park was truly a wonderful experience. As we walked through the apple orchid of Hirosaki Apple Park the sheer volume, variety and amazing textures of the apples make me eager to get my hands on a few prize samples. 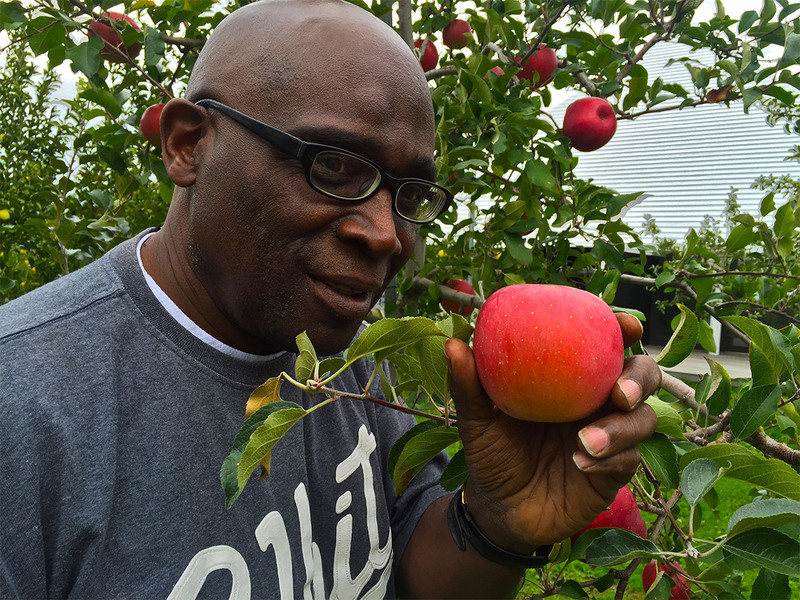 The park supervisors allow me to pick a few to take home and then invited me inside their facility where a variety of apple beverages are available. Delicious! Truly the most mesmerizing part of my travel to Hirosaki City was my visit to Tsugaruhan Neputa Mura. There I came face-to-face with the world-renown gigantic floats, the musicians and the Haneto dancers that make their annual Hirosaki Neputa-Matsuri Festival one of the most colorful and captivating festivals in Japan! Hearing the back stories of how much preparation goes into making the giant floats and operating them is special. There were also the hands on experience of beating a taiko drum and making my own chopsticks in a class conducted by one of the center's sensei (teacher). It was a wonderful culmination of my three day experience! However no trip is complete without shopping for some moment! For me that meant a return trip by to Apple Park and the sprawling shopping center on the park's premises. There you can find everything apple - and I'm not talking about the computer company! I filled my shopping cart with several jars of natural apple jelly in a variety of apple flavors. Next was some apple wine and apple-flavored saki. To round out my shopping list I added some apple snack treats and plenty of apple salad dressing. And for good measures, I bought several more apples to go with the fresh ones I picked myself. What a fantastic trip this has been! 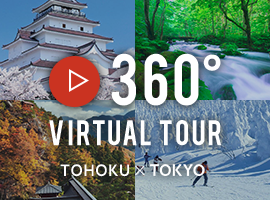 I encourage you to take your own journey around Japan soon! 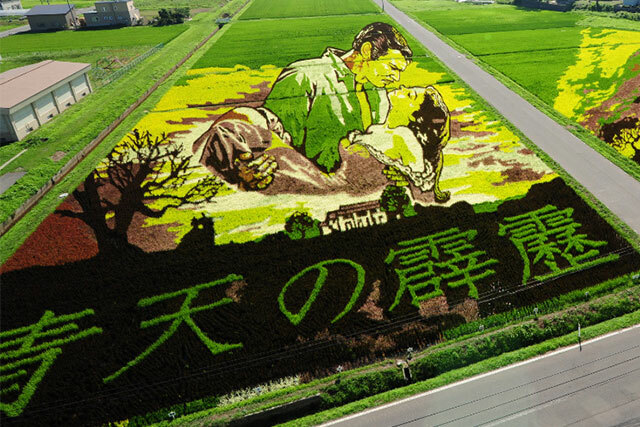 Aomori is the new hot spot of Japan ♡ The Rice Paddy Art is a MUST see!! 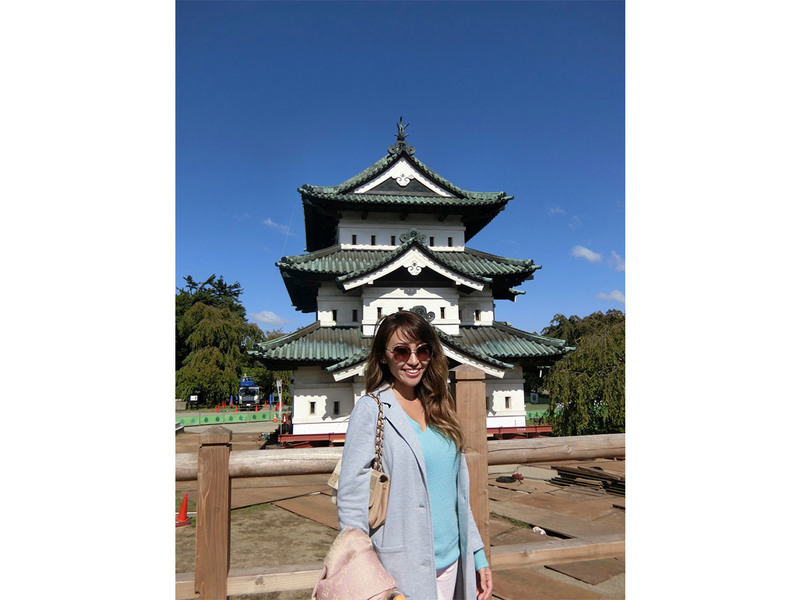 I think Japan offers much in the way of culture, history, tradition and genuine hospitality to foreign visitors and I was anxious to see what would unfold. 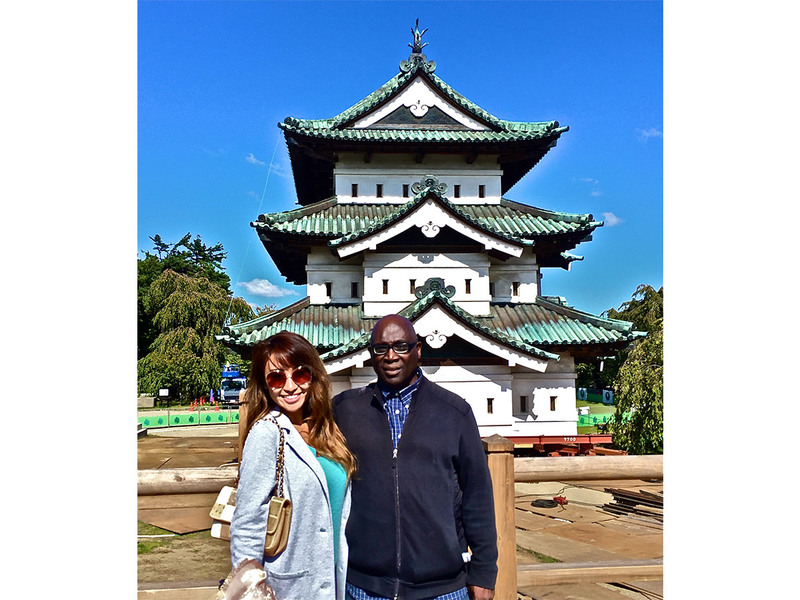 What I discovered was a Japan I hadn't experienced before but was happy to get acquainted with. 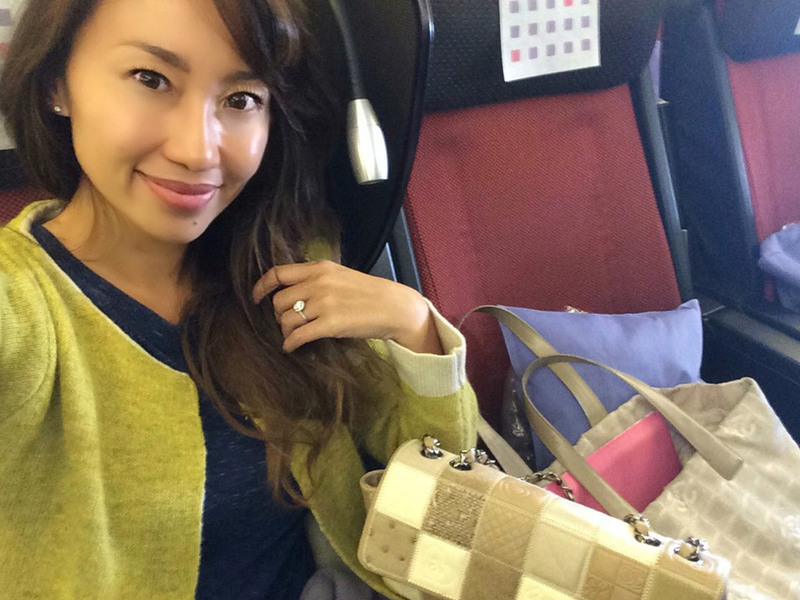 Here are some of the highlights of my amazing journey from Tokyo to Aomori!